This family trip on the high plateau of Ladakh is a way to discover two paradoxical aspects of India: the new middle class bottling in passes above Manali to access the ski resorts and the families living away from all common consumer goods, in a world still preserved from asphalt and mechanical noise. At three, often united in effort, it is a challenge: go through two passes of 5000 and 5200 m with the food and the roof on the back … Thus freed, we will plunge into sometimes minerals, sometimes heavenly universes and always in the pure and stunning beauty. A few kilometers south of Leh, Jammu and Kashmir. 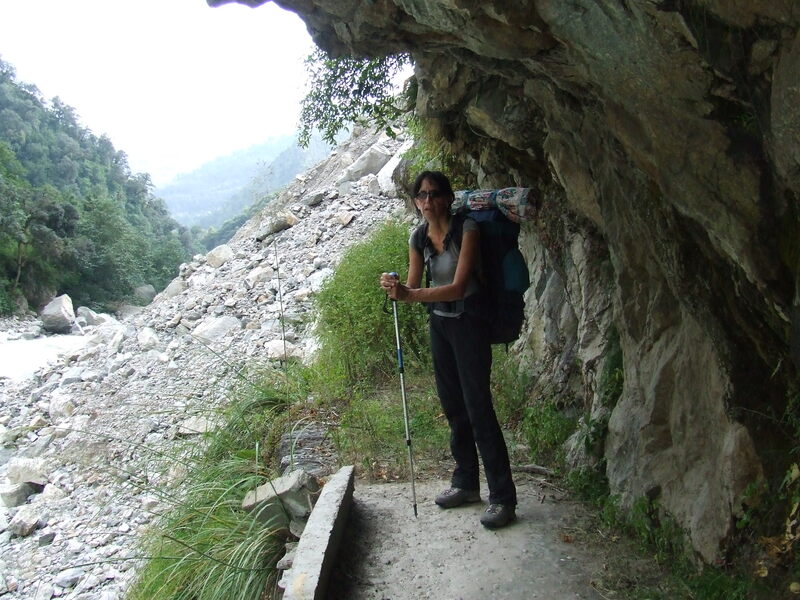 performing a first partial autonomy trek requiring food and sleeping, being in the original atmosphere of a mountain valley. Testing organisms at high altitude and if possible beat the record (5545m;-). 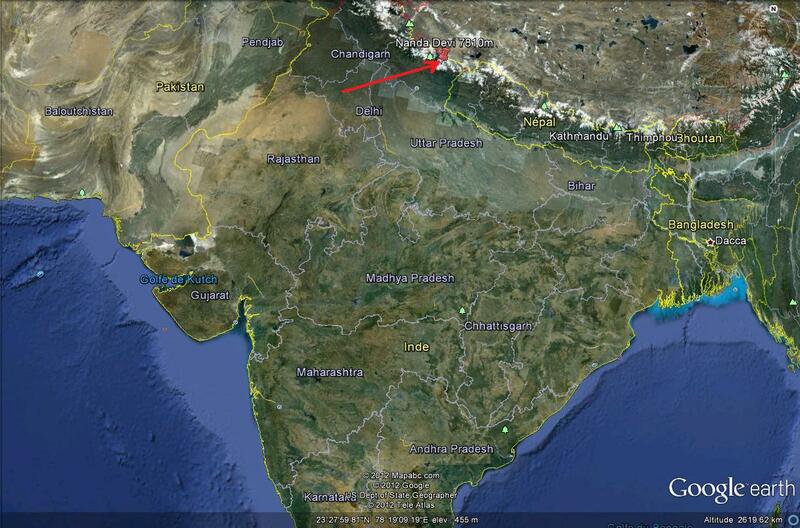 See the possibility of an ascent of Mount Hemis (5650m) from records of levels on Google Earth. For hardware: bags loaded 14, 12 and 8kg. Old Jamet tent for Alexia and Sylvie, a tent canvas helding with two walking sticks for me. Sleeping Bags deemed to held at -19 ° C … Dried fruits, cappuccinos, sausages, soups, noodles and paté for 4 days of autonomy. The route is saved without too much difficulty from Google Earth to the Garmin GPS. Exchanges on Lonely Planet Forum to find out the stops with and without refueling. The journey before and after the Kongmaru la at Nimaling seems to be a problem. In fact, it will not happen. Nimaling offers lodging and covered, at least this season. 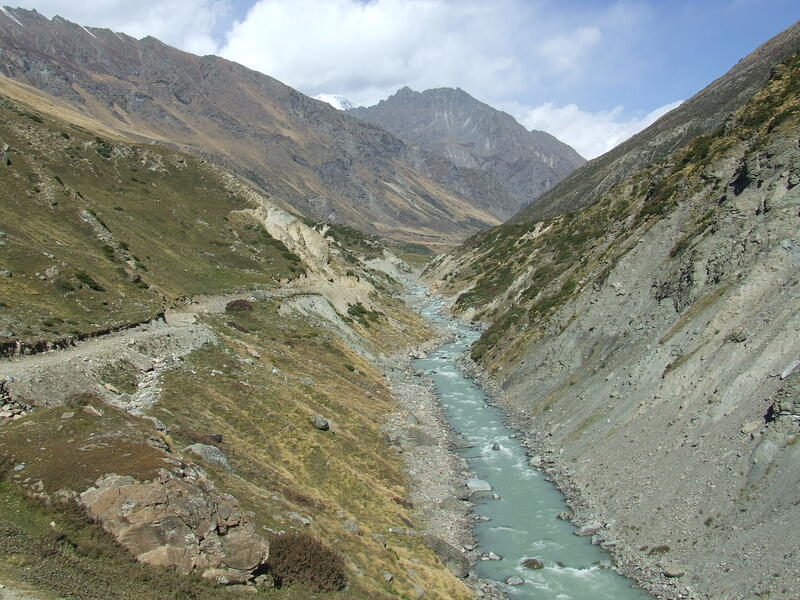 To reach Leh, passing through Delhi is practically inevitable. Flying is the most simple and fastest way. This solution provides the possibility to access well before the opening of the passes, a bit random,on around June 20. The bus or better, a mixed train + bus allows full contact with the population, acclimatization and through spectacular scenery. 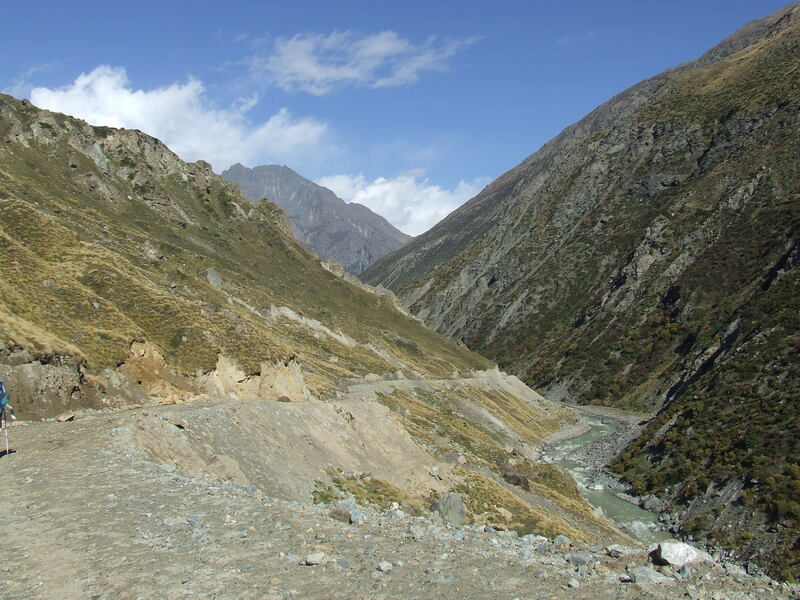 The road passes over 5000m and is the second highest road in the world. This is a challenge for many. A big headache can be at the menu. 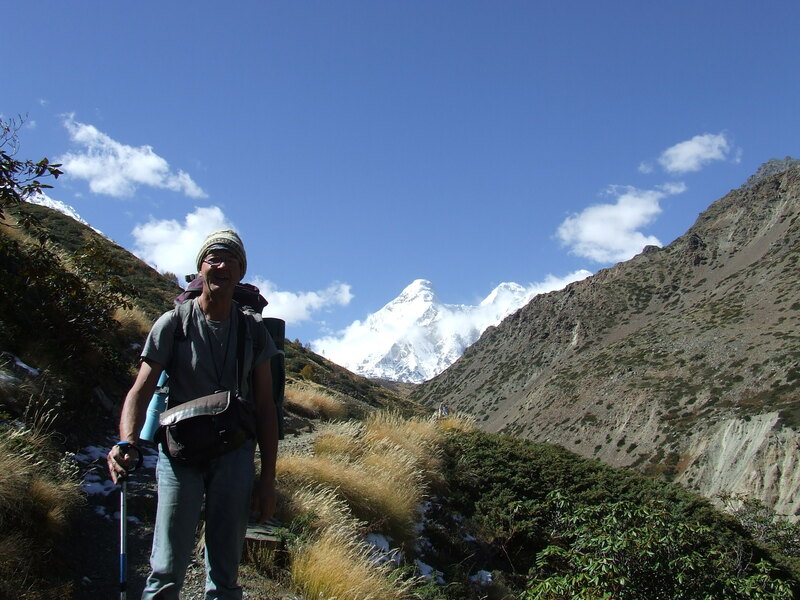 It is possible to trek solo without special equipment, in 7-8 days. A permit is not required. Admission to the park has to be paid at the entrance for an estimated number of days: 20Rs/j. person. Using a GPS is a luxury because the path is well marked, even on the passes. There may be some hesitation at the junction of one or two valleys but just follow the main course of the stream and the largest trail. 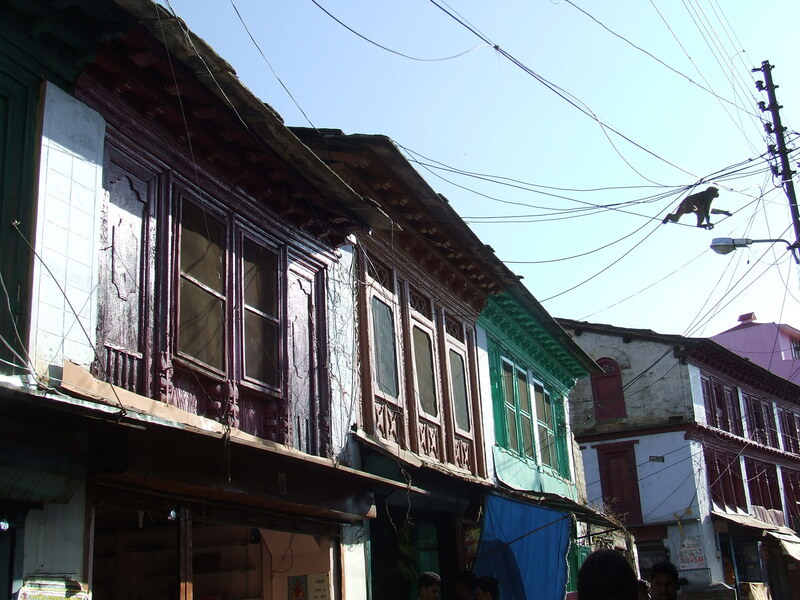 2 – Independent in homestays with stops along the way. Be sure to check their openings at strategic points (especially Nimaling) out of tourist season. The tourist office in Leh is very competent. 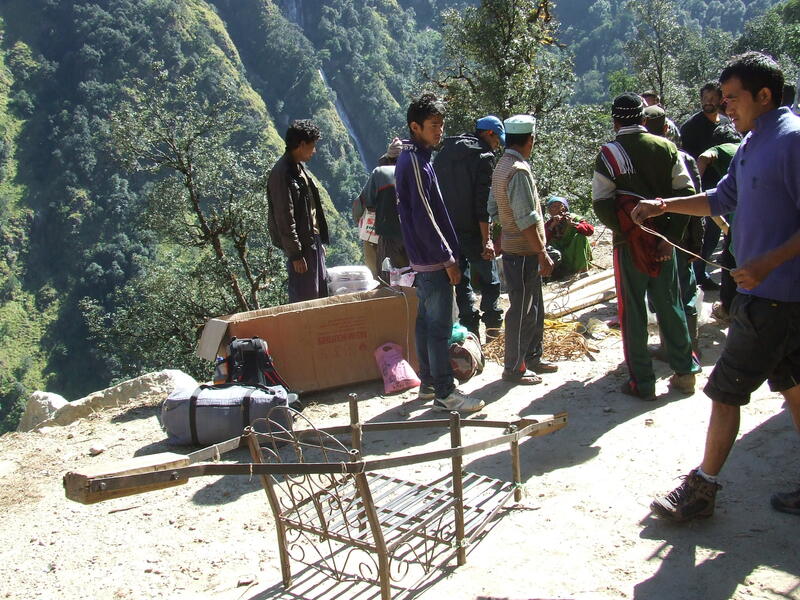 If the Nimaling camp is closed , this is a big step between Hankar and Chogdo and a very big step to Sumdo. In homestays, the welcome is warm most of the time. Costs are normalized: 400Rs/personne for dinner, a bed, a decent breakfast and a picnic lunch honest. Attention, it may be difficult having lunch in the villages without the picnic. Hygiene is limited: the only running water is outside is often the torrent! 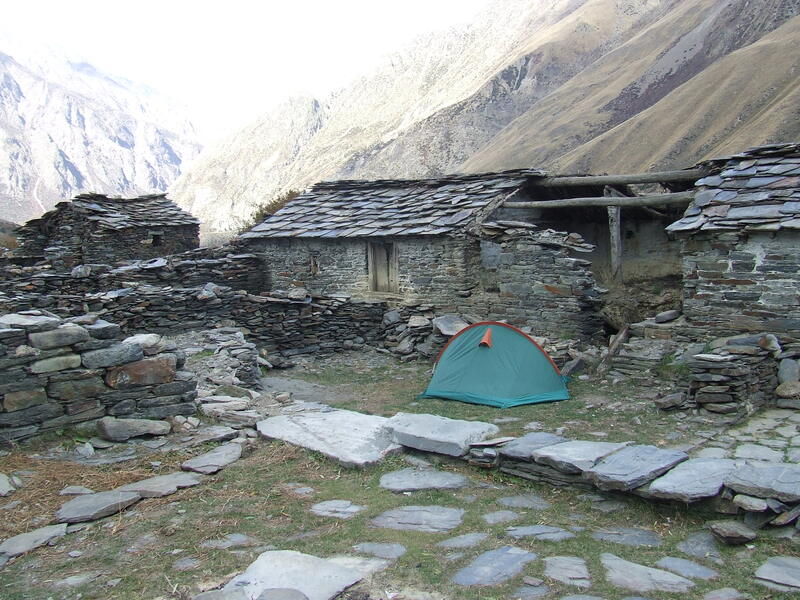 3 – Independent with tent and food for plain freedoom and for stopping from time to time in great places while enjoying homestays for socializing. (quite a few people speak English). Count 100RS for one tent. 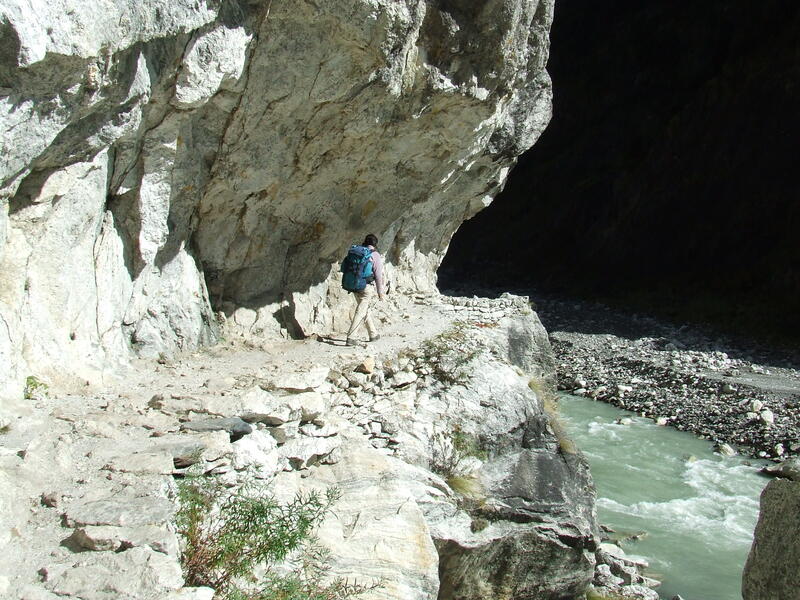 Warning: few people, trekkers and villagers, is on the roads. Altitudes are those of Google Earth. The road to reach the entrance in Spitok village bypasses the airport. We took a taxi which dropped us at the bridge. At this point we payed taxes for entering to the park. We declare a 7 days stay. The cab offers to take us to Jingchang because a good track is now open until this hamlet. His rates are prohibitive and no comparison with those applied in the region. We prefer to start on our own rather than getting ripped: we have time and we remain in line with our project. The beginning is difficult because the track is dusty and totally exposed to the sun. We are doubled by a dynamic team before to engage in the first valley. The rest of the day is also tiring because we have to get used to the new rhythm. The altitude is already higher than most treks to their beginnings. We had time to acclimate to Leh and we do not suffer, at least in appearance. While I’m sitting, waiting for the two girls a little behind, an old lady come up to me and I understand that we can accompany her on the other side of the river to Jinchang. We must recognize that we would not have found our Jingchang halt without her. It’s a beautiful Ladakhi building to regain strength. Dinner is hearty, the sleeping room is correct. The toilets are dry. There is no water inside the house. The torrent is needed to bath in the evening! The kitchen and living room are wonderful with gleaming brass battery. We will find this model of lodge all along the way. Our host let us on the road after breakfast (eggs toast, tea with milk and sugar). The weight of our bags requires a slow progression. The ascent will be tough today. The gorge in which we penetrate today offers more shade than yesterday. We have lunch at Rumbak (34 ° 3’32 .83 « N, 77 ° 25’21 .35 » E) in a small restaurant located under a parachute! These shelters are also standardized like the prices. White circular tasks on GE satellite photos are no longer a mystery now! 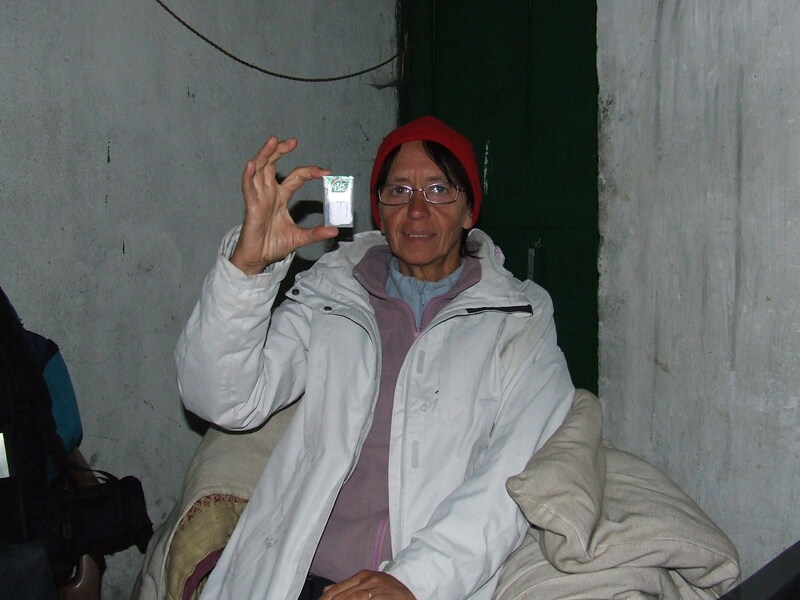 The lunches will be mostly light in these shelters: small packets of Chinese pasta and milktchai or coca. There are also cookies and chocolate for Alexia! The climb continues in the afternoon and we stopped on a bench beside the road 1 km from Yurutse to test the camping equipment. Conditions are spartan, this is the price of freedom. Small step today to acclimatize slowly to the altitude. The rarefaction of the air begins to be felt. 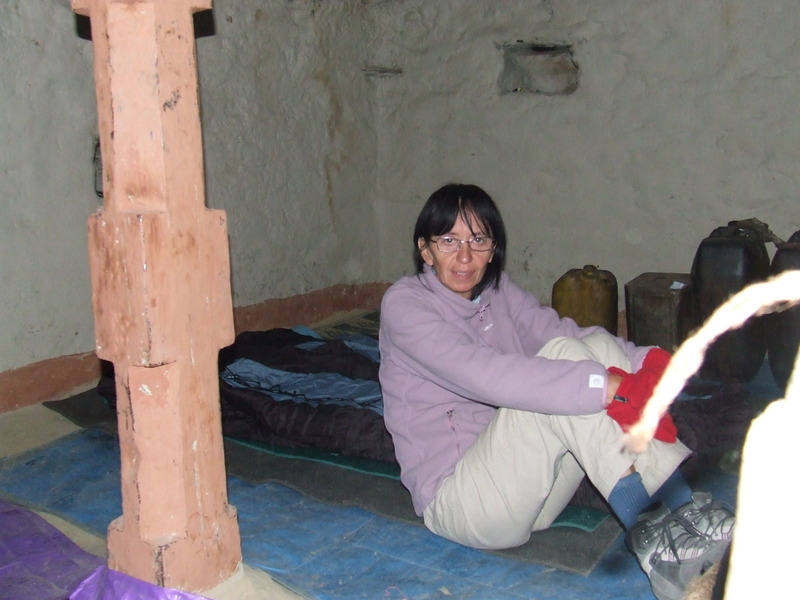 Yurutse consists of a large house converted into a homestay (34 ° 2’35 .59 « N, 77 ° 24’5 .96 » E). Small fields in terraces give it an almost fluorescent green setting. This is an unexpected paradise nestled in the arid mountains. 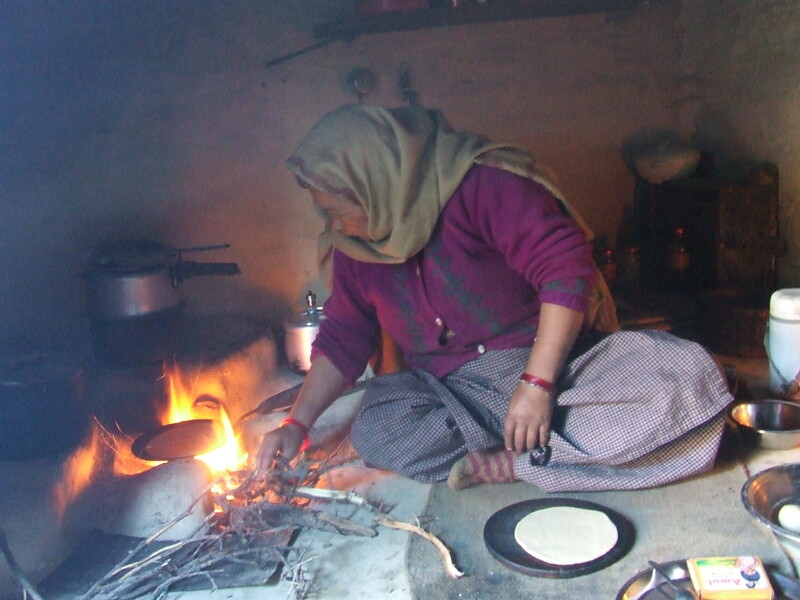 We supplement with breakfast with chapatis and tea. We find the first snow-capped peaks in the clouds and our first marmots. 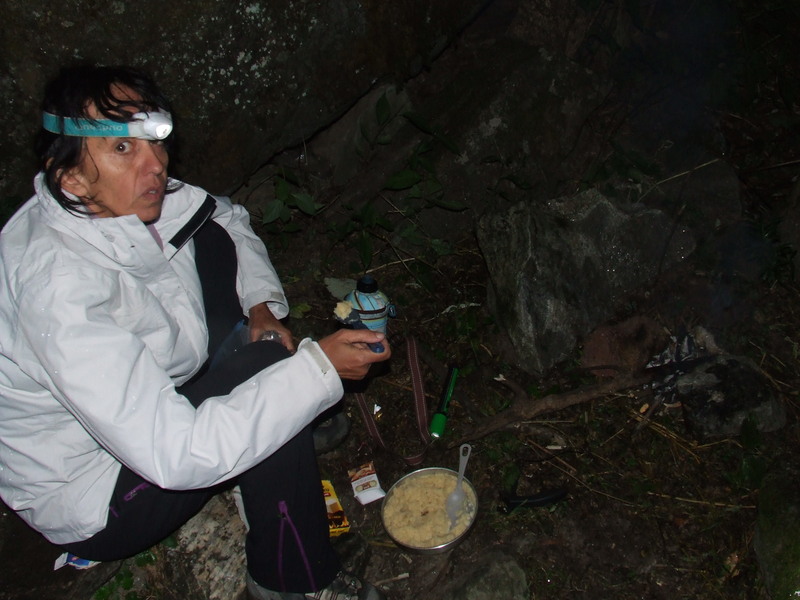 We lunch at the first base camp (34 ° 2’47 .29 « N, 77 ° 23’16 .02 » E?). It is possible to sleep there apparently. The weather is gray today and a few drops of rain are coming to cool us from time to time in the afternoon. The almost continuous rise goes on until the second base camp. The climb never seems to end. The weather is mostly gray and we feel the cold as soon as we stop. View discovers on dry and sawtooth peaks . 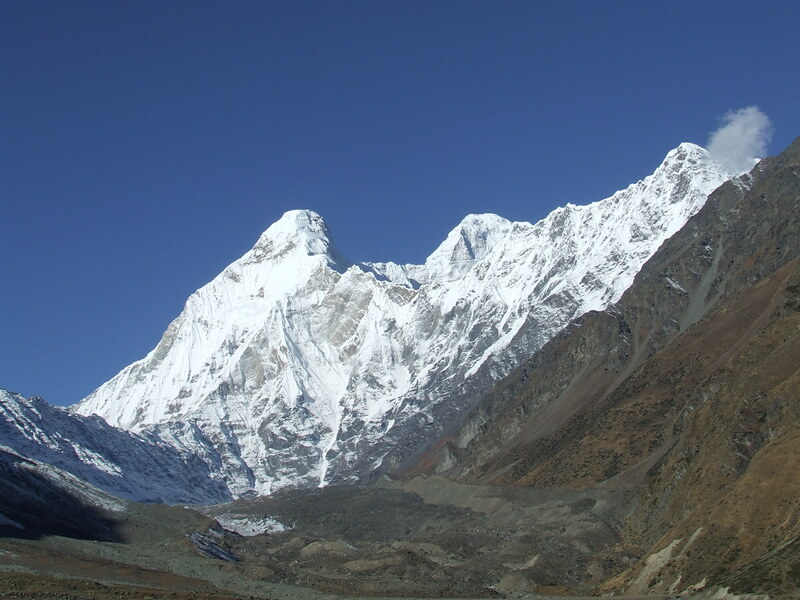 We do not stay long on the pass (34 ° 2’29 .29 « N, 77 ° 21’44 .71 » E, 4975m) as the wind ice. Weather gets up in the descent. 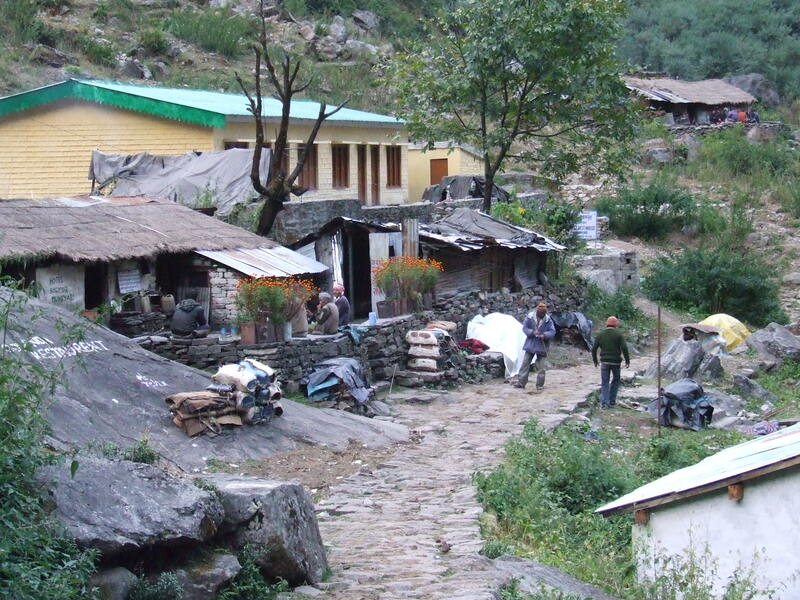 Shingo is the first village after the pass and we will settle there for the night. We camp again although homestay could open its doors. The valley narrows to open on the Markha valley. At the intersection is Skiu. We feel that a road will come soon from Chilling on the right. An excavator was landed by helicopter surely? these big machines are still a mystery in the middle of nowhere. The uncertain electricity is already there to open up the valley. 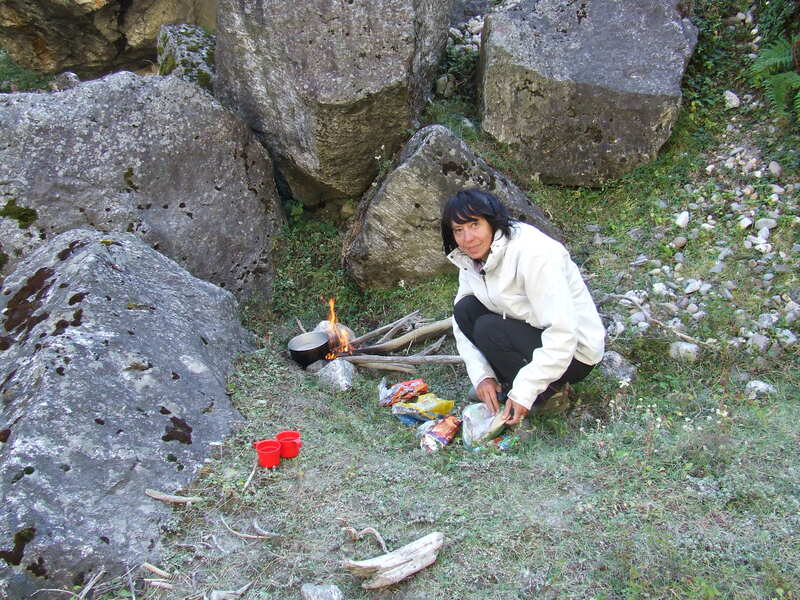 We stay in a homestay at the entrance of Skiu where we receive a very warm welcome for lunch. The brightness is special here with alternating gray clouds and white sun. We walk in the surrounding gardens. This is yet another small step to avoid causing the two girls quickly inclined to grumble. 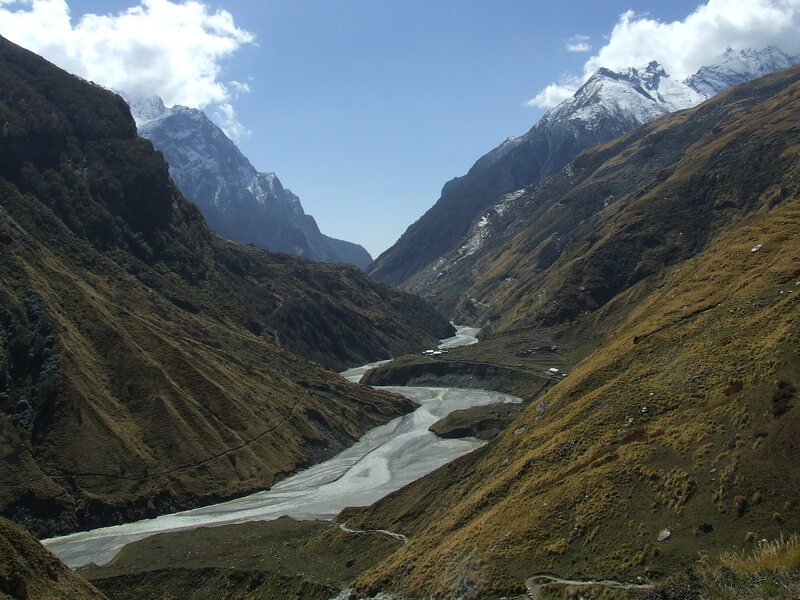 The Markha valley is very wide. The road become less steep and we enjoy warmer weather from Skiu. 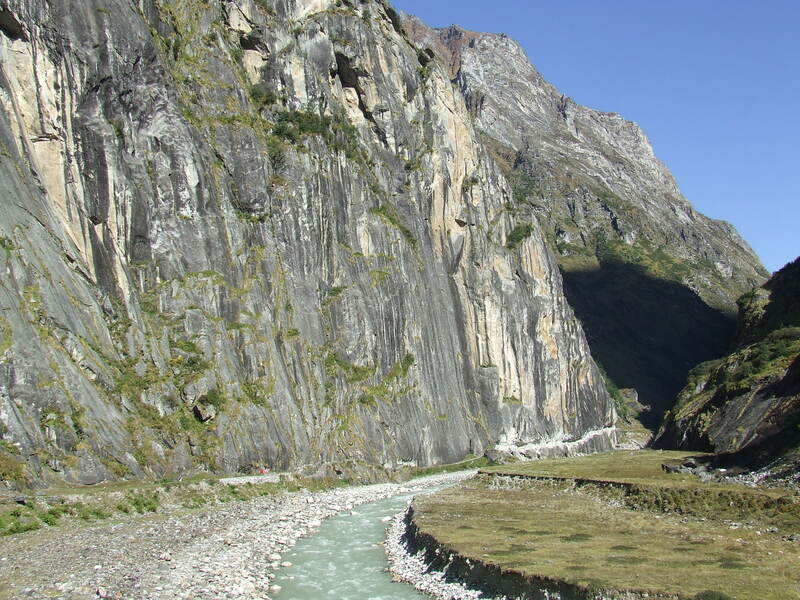 Valley offers spectacular scenery between green fields and gray rocks composing the mountain slopes. People here live simply, with basic comfort that does not affect their happiness to live, at least in appearance. It is true that we are in summer. 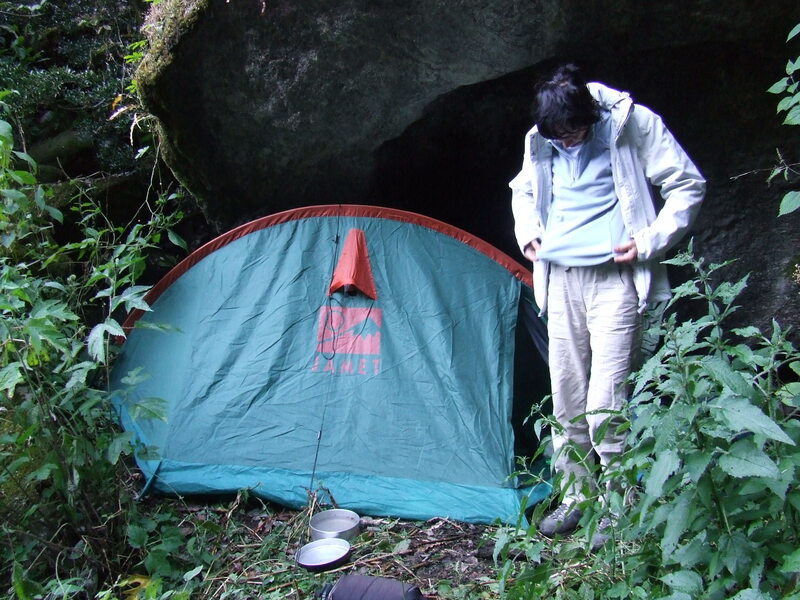 In Sara, we set the tent on the property of a homestay. The owners took the opportunity to get rid of them very curious and rambunctious kid. He joins us to pull up the stakes of the tent. We curl diplomatic incident with parents. Cool. Complete toilet in the Markha torrent. 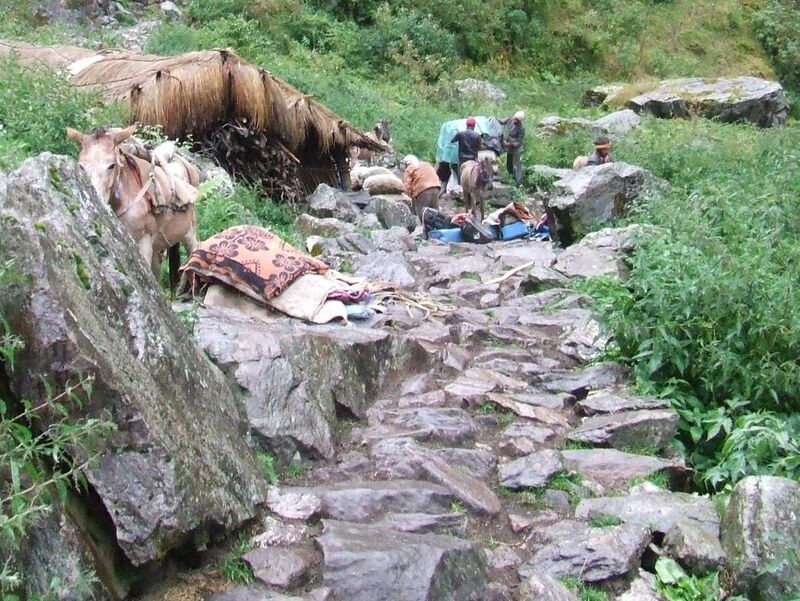 The path continues to climb slowly towards the largest village in the valley (it has given its name to the river). We conduct our first fords. Nothing but happiness for your feet. Since we took our rhythm, our steps are almost half of the steps in the guides. We take full time to be with people or simply admire the sceneries. Definitely clear weather puts us in a good mood. 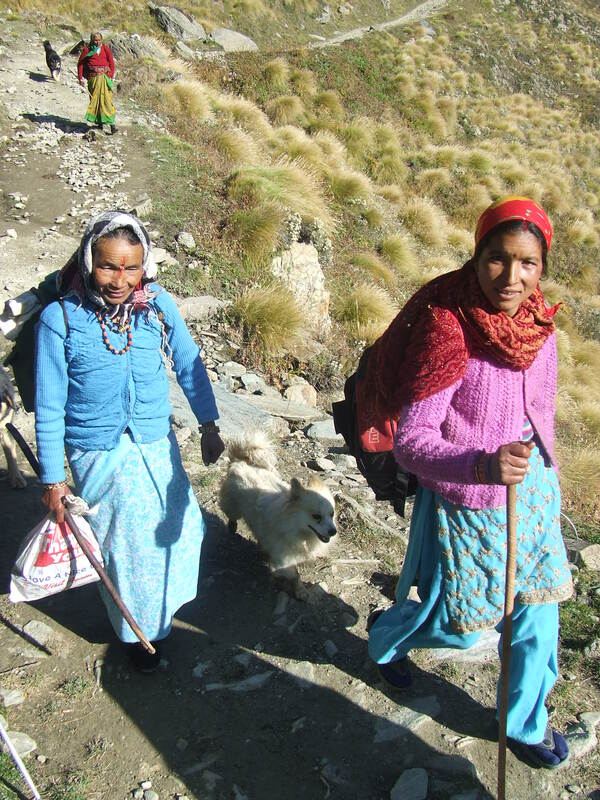 We go through the first two homestays at the edge of the village to seek the center of the village. But there is none. We find no more at the output. We are obliged to retrace our steps. We plant the tents again. We make a rare meeting with trekkers. They are Swiss, Austrian and Australian and we are happy to talk with them and spend a very nice evening. We start with an overcast weather but it clears in the day. Damage for photos in Markha. We spend twice fords. 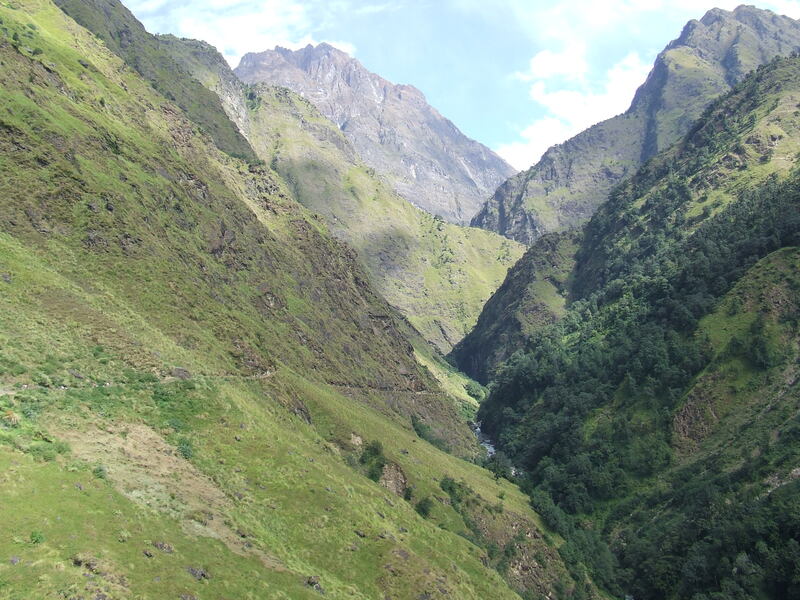 Mountain slopes meet increasingly the torrent. We are in front of a majestic 6000 cone . We arrive to Hankar for lunch (rice and vegetables for 60Rs). Laundry and toilet in the Markha afternoon. We leave the valley tomorrow. This will be the last night in a tent in a comfortable temperature. We left late this morning at 9: 30 because I realized that my diary had disappeared .We search for it in the garden. I finally found hidden under a grove by the kid (5 years!) … We must definitely watch these brats that looks so nice at first glance. We stop for lunch along the torrent. A Gorals herd tumbles of the mountain. We count fifty heads. I badly located Nimaling in GE and my hypothetical point proves false. Whenever we meet a shepherd, we ask if we are still far away. They respond consistently « at 2 to 3 hours ». But time passes and we exhaust ourselves in the climb. At 16: 30, we realize it will be very difficult to achieve this last stop before the pass. We find a great place to spend the night at the edge of a small lake, protected from the wind by the walls of a shepherd hut, probably. There is enough wood to cook and warm up a bit. I found a source upstream of the lake. 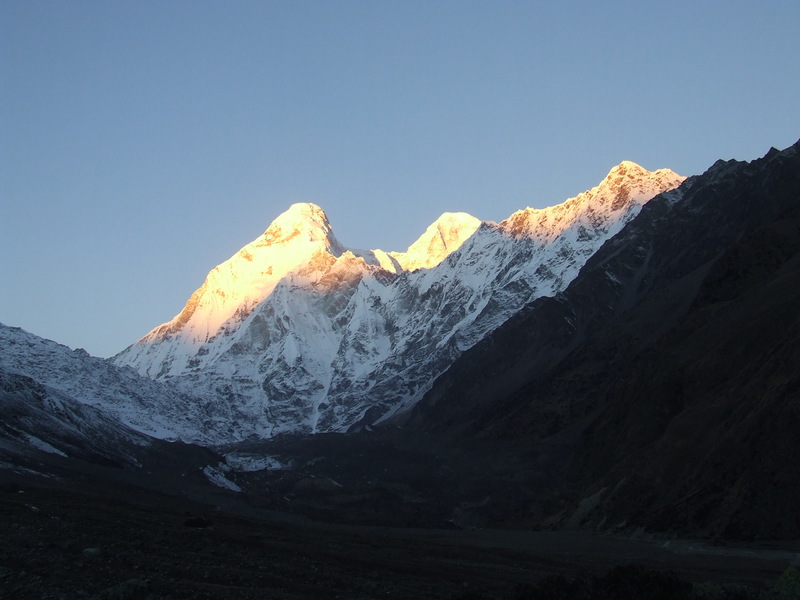 We are witnessing the sunset on the Yang Yatse 6401m. It seems very close to us. It was not possible to find a better location to spend the night. We operate all of our equipment without really premeditation. The effort of kilos carried up to here was not vain. It is a double pleasure. Great dinner of pasta soup and pâté. We were still far from Nimaling (33 ° 47’11 .45 « N, 77 ° 35’38 .80 » E is obvious when you went!). 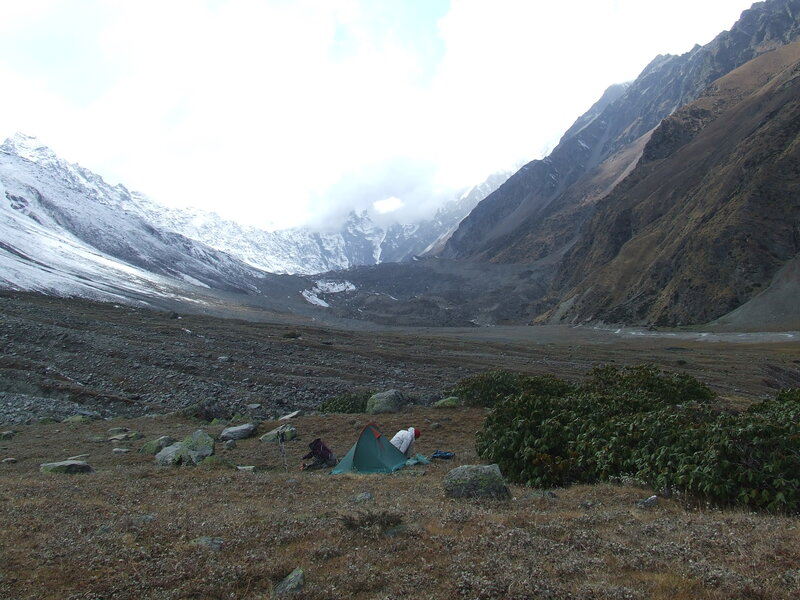 This large area of ​​grassland is nice to relax before the big climb in zigzag leading to the Kangmaru la. It is possible to have a lunch there and to sleep under tents, at least for the summer. The shepherds seem to be installed by a large part of the year. You must be patient in the climb, avoid looking further than your feet to avoid depressing. Breathing is difficult. A slow rhythm must be necessarily found not to get out of breath. The two girls become grumbling turtles. They stop more frequently. Time remains beautiful but I fear that clouds come to spoil the view at the top. I go back to unload Alexia from her backpack. The victory is not small when we finally pass prayer flags. Alexia pitched a big headache which disappears in the descent. We descend rapidly on the other side because the wind pierces. You have to go a long time before finding to camp with some water. This is another great place to spend the evening and night. Firewood is not missing.We are not the first ones to stop there. It is unfortunate that the entrance fees to the park are not used for a spring cleaning even soft. The quantity of garbage, here as somewhere else, is not very important, but apparently there for a long time! The weather is always correct. The two girls consider already arrived at the end of the trip. They are excited to sleep between four walls tonight, on a mattress. 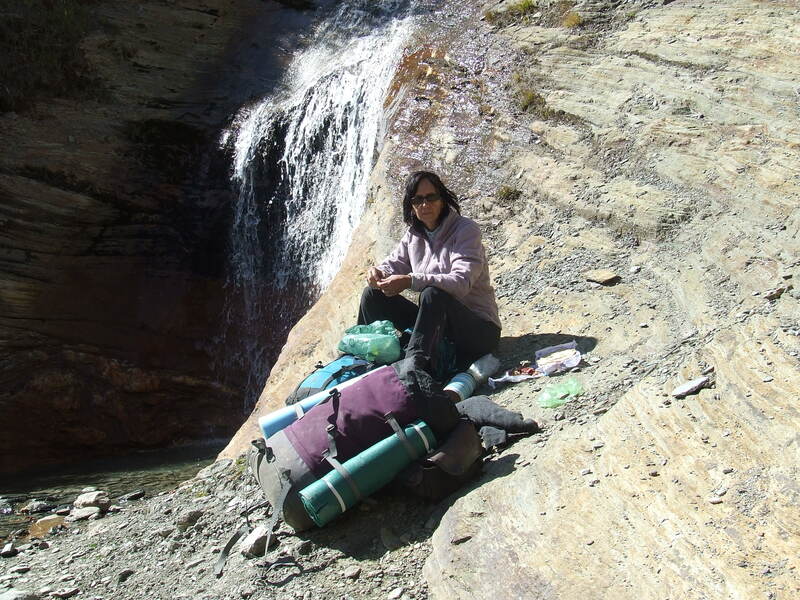 Tired, Sylvie slides on a stone across a ford, pulled by her backpack. Her shoulder is hurt. 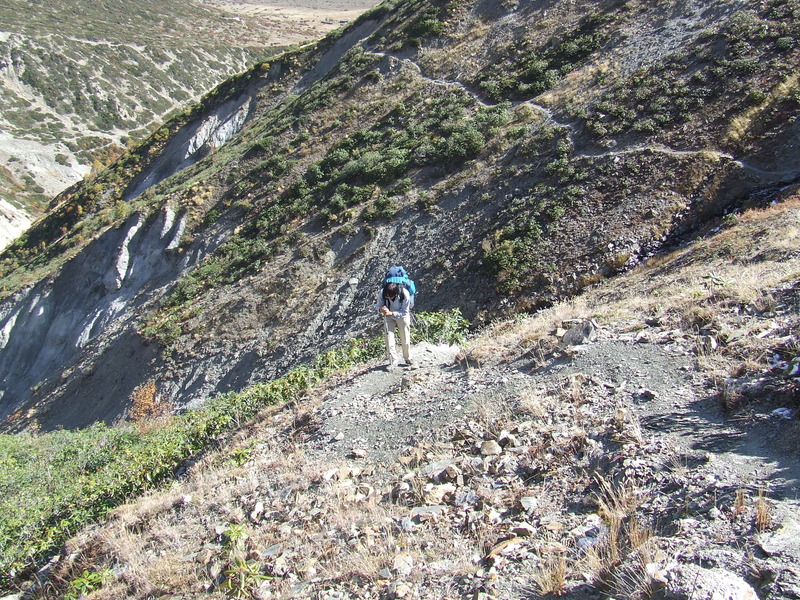 After Chodgo, it is not possible to go on the left and attempt the ascent of Mount Hemis. We have no food and we are too tired. Such a venture could be conceived independently of A long preliminary walk. The walls of the mountain are sometimes cut in toothed tongues forming multiple parallel saws. We unnecessarily cross the village of Chodgo . It does not seem to have homestay or tea stall to have a lunch. In Sumdo, we come back to the mechanical civilization after 10 days of a benefit withdrawal. A bus takes us next day at 9:00. Towards Leh, almost non-stop. Delhi – In the early morning, docks are already crowded. We step over bodies maybe sleepy. Really sleepy? We seek our way in this imbroglio and we are slowed by our bags. Nothing is displayed and people do not really understand what we ask them. They tell us numbers with non existing platforms . One dock seems more likely than others. Here are pestilential odors because people defecate on the tracks. This is the Call of the Earth: Everyone at the same time, without shame. I’ve seen these rituals during a previous trip but people were out in their slums tumbling onto the tracks. We invite us into this world curious about our presence. It is not possible to put our bags down because the mud would mess them inexorably. We look at the crowd. The day is now well risen. A train pulls into the station slowly and people congregate against cars still running. They are trying to go through the windows when they have no bars. When they can not get in, they put their affairs on seats to reserve their places. Our bags are our enemies. They prevent us from being quite fluid in the human alternately refluantes tides . Finally, a door opens, where all those who have not gone through the windows rush. This is because some have mercy on us that we find finally a place to sit down. And then things and people settle in an appearance of order, calmly, resignedly. Everything seems immovable, as in a precarious and tense balance. The life has become again almost livable, not that the stench has disappeared, nor moreover than this wet heat which sticks clothes and skins on the skin. The train moves on. This jolt gives a sense to our efforts. We are finally going to go out of the city. 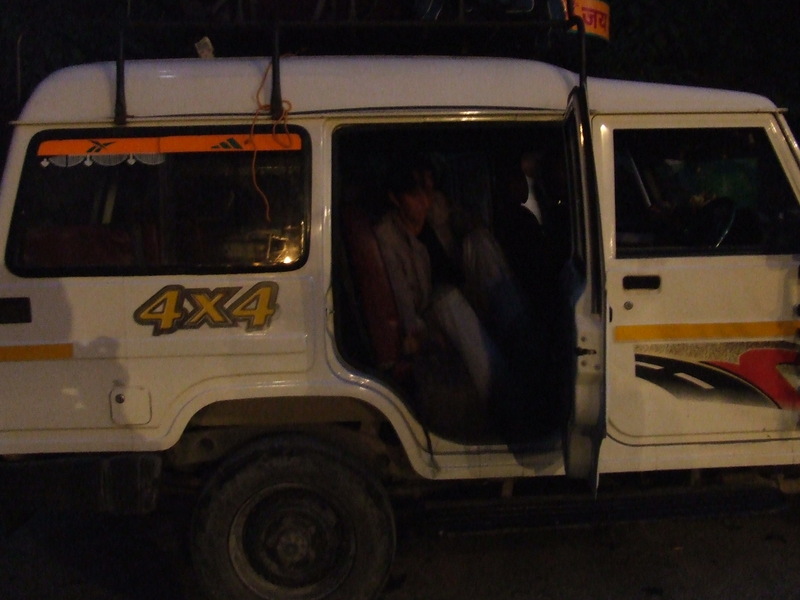 By way of imposture, everything began when our bus stuck in an inextricable traffic jam of cars rising, downward and parked at the approach of Dharamsala. Only horns were working, as if they were going to be able to, to them only, arrange the situation. At the end, our driver found an original solution by making us all come down to make half tour. We finished our road by foot, excellent training for the future treks after all. Welcome to Dharamsala! But it is only a beginning, a front taste of our stay in this imaginary paradise. In the bustle and the metallic messes, we move forward to a guest house. The rain meanwhile enters itself in the party. The hotel is also full as the street. It remains a last bedroom giving onto the street. It is clean, the staff friendly , the menu tempting. (this is one place where we will eat the best of the trip). We decide to stay and go to lunch. It is entering the bedroom for a well-deserved nap that we understand our misfortune: street is decongested : a cacophony in major Tut awaits us until very late night. At the moment, when we speak in France about India , it is often under a purely economic angle. India frightens! « It is about one of these famous emerging countries which could soon have say in our international authorities ». « They steal us our jobs ». « They work for one wrist of rice » . « And Tata with his new 2000USD car which dared to acquire our beautiful Jaguar ». « And Mittal, the Big Miserable Boss without humanity which plays with our beautiful factories as the Monopoly. We are going to fire him from France, right? » And so on. 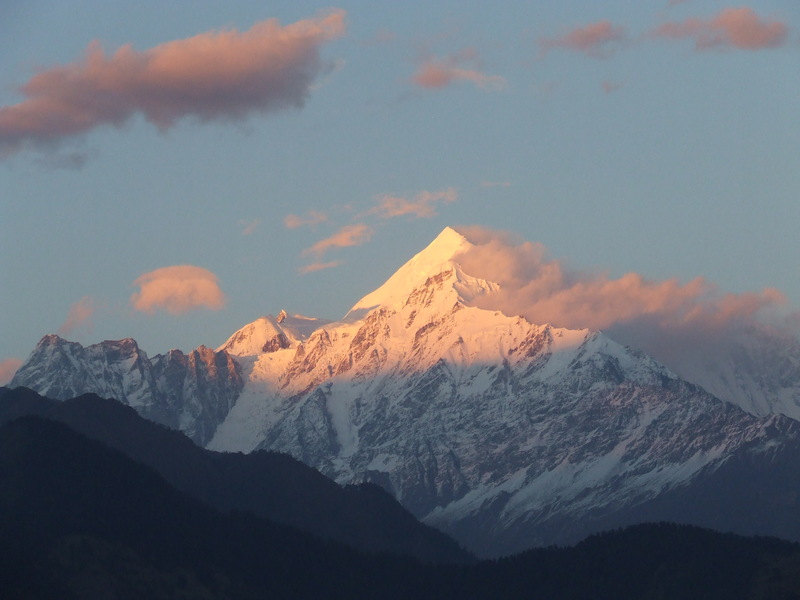 When we try to join Manali, at the foot of the true mountains of Himalaya, we are in confrontation with the economic emergence of India by much more prosaic aspects. 300 million Indians have quickly entered the middle class. Meaning that these people do not work any more only to eat, find accommodation and get dressed, survive in a word! They accumulate enough money to reach the leisure activities and the not vital needs more generally. To begin with the holidays and with the automobile. They make as us from now on. They make as us fifty years ago and as we even today. But on one hand they are much more than us and on the other hand infrastructures did not evolve at the same speed. Thus they go out of megalopoles in their own cars and make enormous rows to go to holidays. 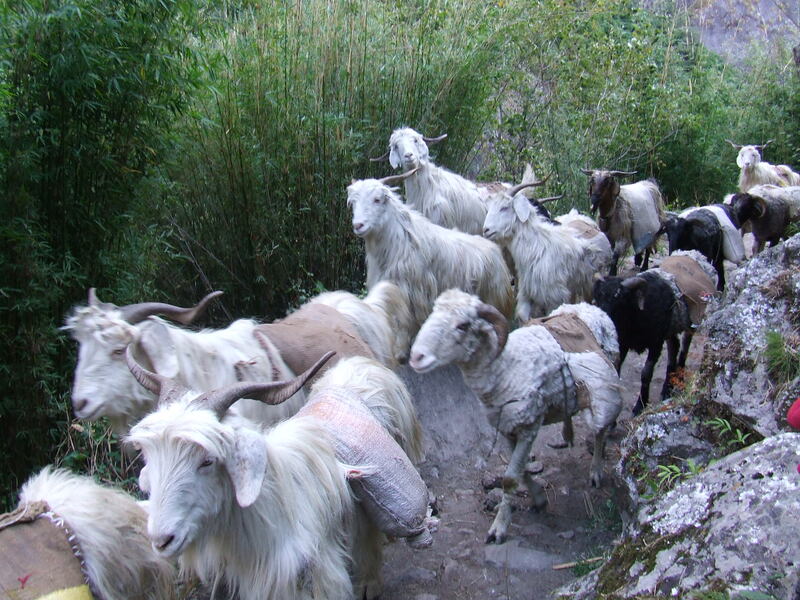 It looks like they all were made an appointment in Manali. It is clear that the air is there much cooler than in the Big Plain. Imagine the snow in Delhi! Imagine one large field of asparaguses on Mars! …To see the snow, slide on the snow for the first time! Waiting for it, the rows stand still on numerous tens of kilometers, in both directions. Indeed, the road is too narrow to cross and there is always someone to try to double and pass at all costs. It is not specially Indian. Indians are on the other hand more fatalists than the Westerners. The Hinduism wants it. We can thus see a continuous row and segments of rows just as much blocked, in against direction. People remain always smiling. They will drive on empty highways in their next karma… In the meantime, they photograph us with their babies to constitute their albums. New hobby. It is in this way that we beat our record of slowness by bus to reach(affect) Ladakh: 115 km in 12 hours, up, the 9.58km / hour. The plane? It is just 100 times as fast! 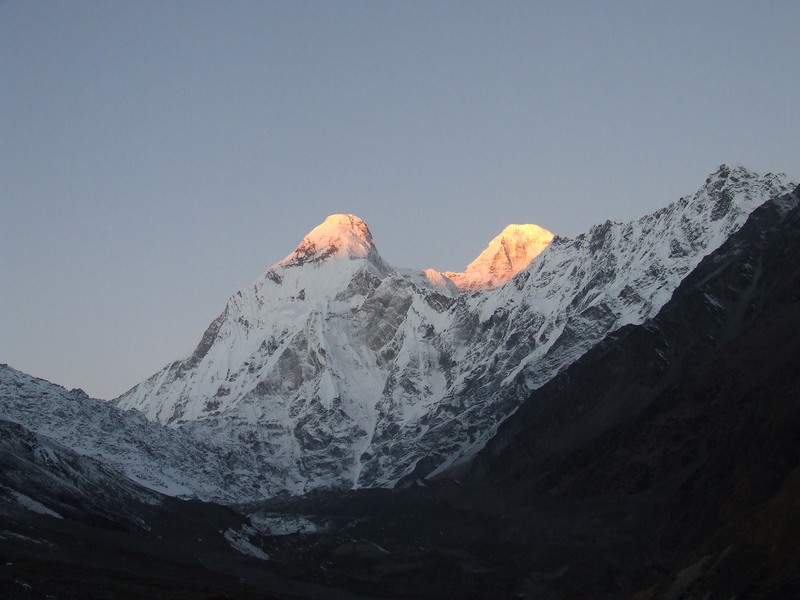 Our goal : to come as close as possible from the monster that is the Nanda Devi, a sacred mountain of 7811 m, by joining one of the base camps, east of the summit. 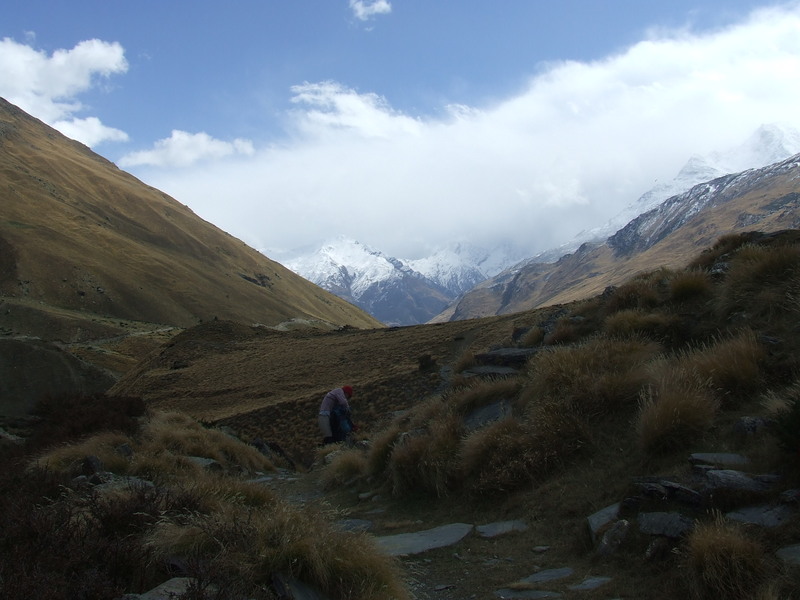 A secondary objective is to cross the glacier Milam from its left bank before returning to the lower valley. 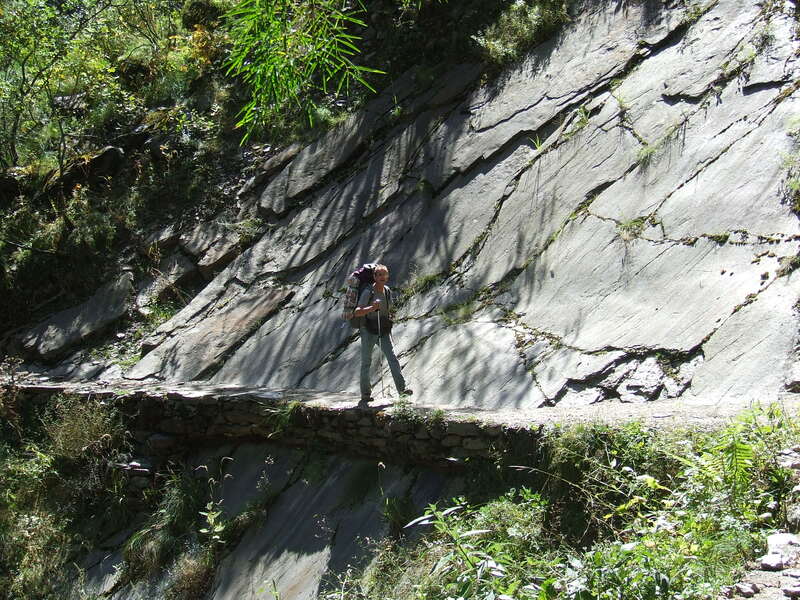 Background: Travelling with minimum weight to be flexible is our motto for this type of trip. To avoid excess baggage weight while permitting a maximum of autonomy for being at the center of events, even if taking some risks is necessary. 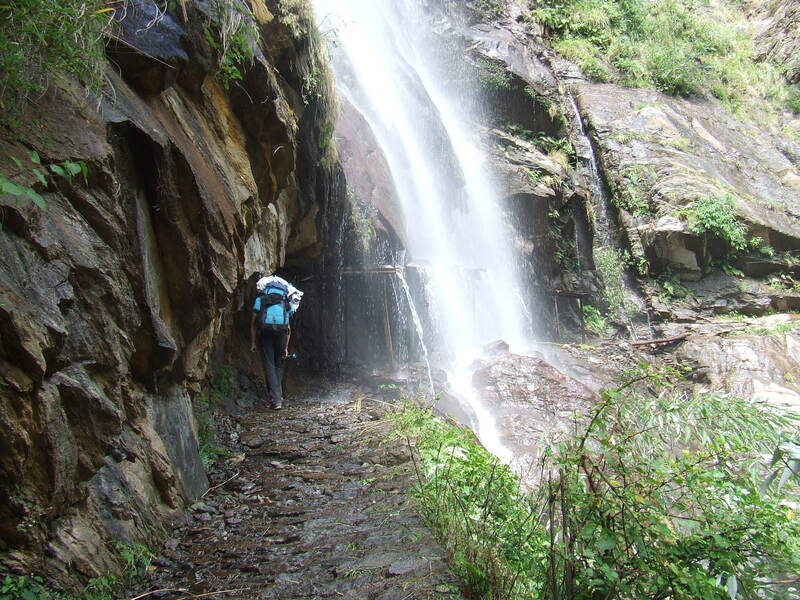 The ideal period is autumn following the summer monsoon, especially long and abundant this year 2012 (there were reports of landslides due to flooding in lowland to mid September). October is also the month of migration of the inhabitants from the upper valley: as no more pastoral activity is possible in winter and since the trade route was abandoned in 1962, the upper valley is emptied of its inhabitants for the six winter months. Many villages are temporarily totally abandoned. 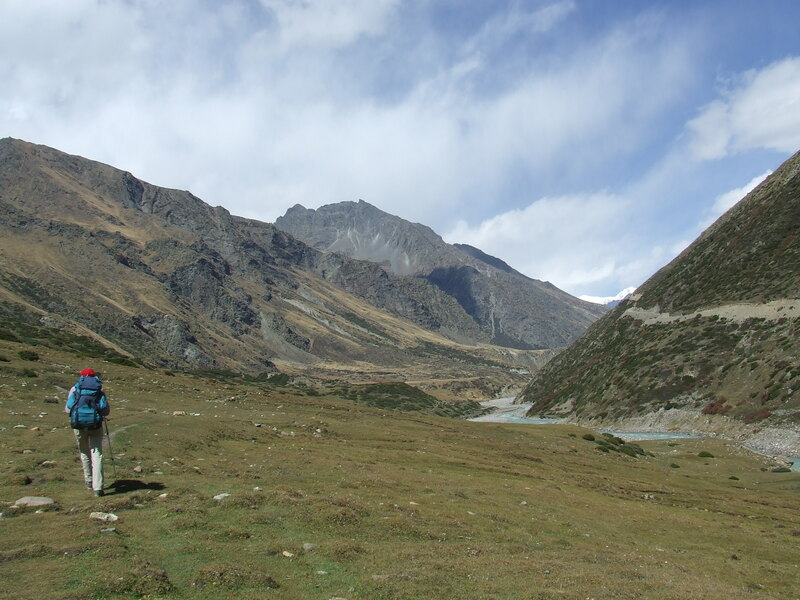 Preparation: This trek was in our heads for several years because the range of time when it is made possible with a sufficiently clear weather is very narrow, from late September to late October. We used Google Earth, Lonely Planet and the Lonely Planet forum, very useful. We have not found any valid map on Paris because this region is virtually unknown there. The accuracy of the satellite photos was sufficient to create a marked route using GPS. As we shall see, this preparation is not sufficient because recent landslides have changed the track’s places sometimes on several kilometers. GPS : the daily journey must be recorded for keeping the daily distances traveled. This has not been done this time. This year we did not perform any special physical preparation outside jogging, walking and swimming. We are in good physical condition before leaving. Sylvie is a little tired. 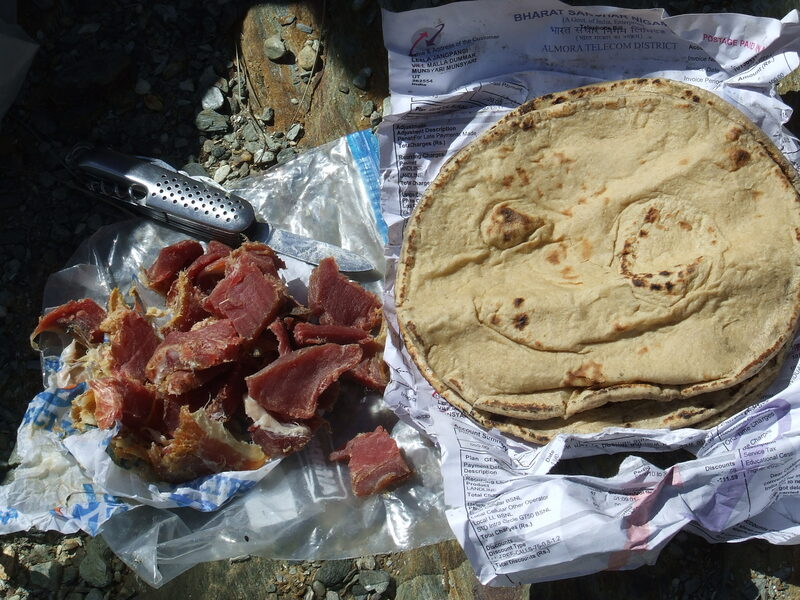 Backpack: initial weights are 16 and 14 kg including in particular a 1.5kg tent, two sleeping bags -9 ° C so-called « comfort » of 1.5kg each and food for at least 5 days including dried ham, semolina, sausage, county, chocolate, instant coffee, dried fruit for 4 kg. They are too heavy. 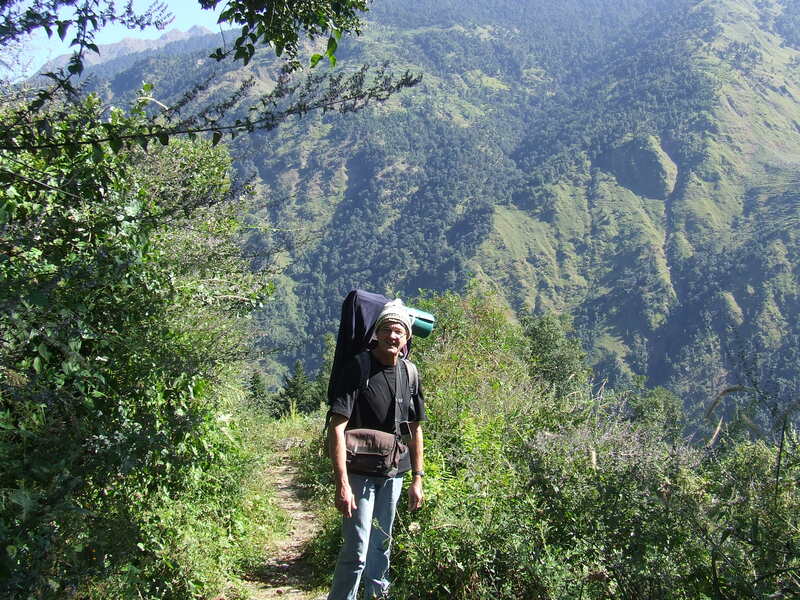 We absolutely need to reduce weight for the next treks. 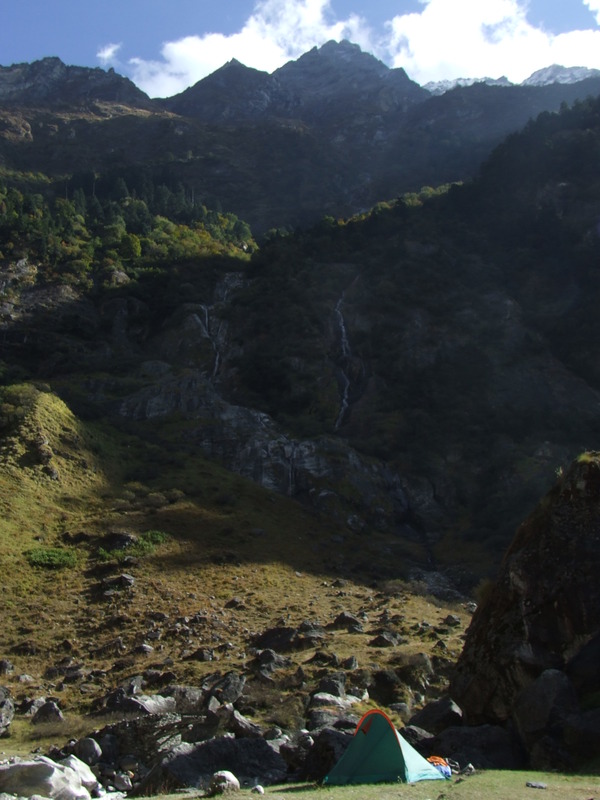 Access to the Milam Valley: The first part was made with Air India from Paris to Delhi 22:30. to 9:30. Flights with this company are always pleasant and punctual until now, with competitive rates. What more to ask for? The train from Old Delhi at 16: 00 is a good alternative to avoid night buses starting from Ghaziabad evening around 22: 30. It stops after 7h route in Haldwani where is the bus station and jeeps. 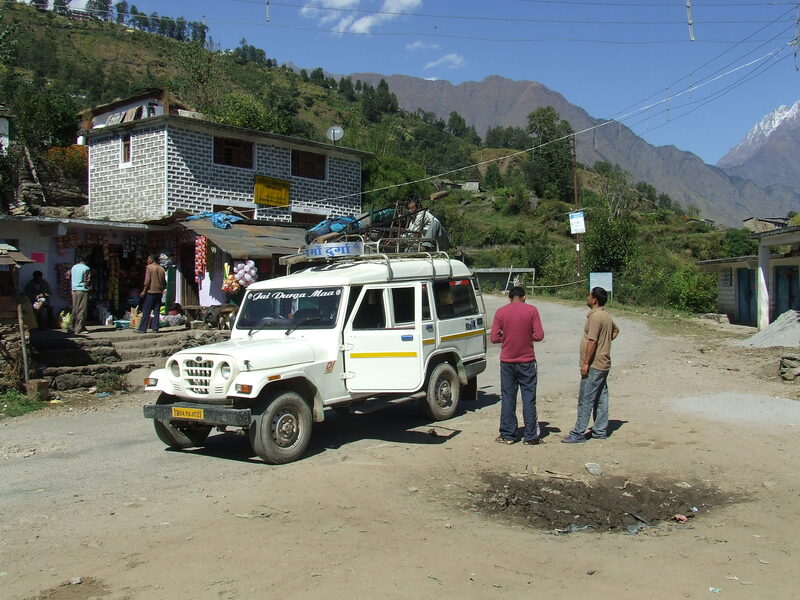 Jeeps are a flexible and cheap way to reach Munsyari from Haldwani. It does not seem possible to go there directly. One or two changes on the road are surely needed. Without wasting much time, we reached Munsyari in 38h from Paris. We may be accustomed to travel in this megalopolis but we are always overwhelmed by events. This time, we learn at the entrance of the new metro that it is closed for maintenance. More than 2 weeks after, it will still be closed. It is amazing to see a so recent work paralyzed in this way. 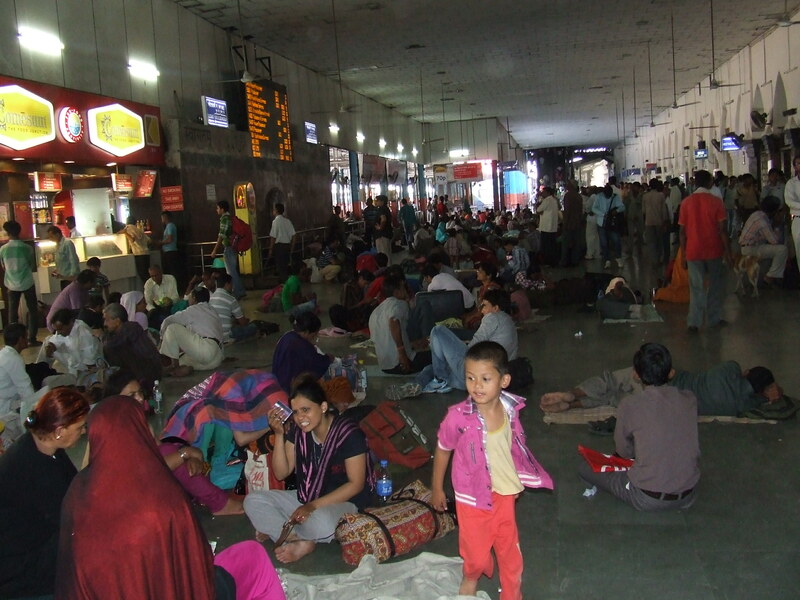 We arrive at New Delhi Railway Station at 11am to buy Delhi – Haldwani train tickets. Indeed, there is a special office in NDRS for tourists and tickets are issued on specific quotas. We know that a train leaves at 16:00 but booking in France on the Indian Railway website is impossible due to an obligatory No. Indian phone required! Upon arriving, we are told that the office was moved to Connaught Square and we stupidly believe it. In reality we are taken to a travel agency. The lost hour prevents us to book because the minimum delay is 4 hours before departure. It is also good to anticipate a wait of at least 1 hour because the queue can be long. We change euros in Main Bazar Street in order not to be caught in the mountain villages where our Western currencies must do the effect of Monopoly money. Unless absolutely necessity, do not change at the airport because the change would make you lose 6% of the value. We go to Old Delhi Railway Station considering to take a night bus at Ghaziabad if we can’t book our train seats. There, happily, we buy our tickets 136Rs/billet less than 2 € for 7 hours by train. There is a McDonalds in ODRS. It’s not that I like this type of restaurant, but we are happy to delay spicy food experience until it will be necessary. The train leaves on time. We enter a car by random. Controllers are kind and let us sit at numbered seats for which we have no right. But how could we know where to go when nothing is specified? Fortunately, this time, the train is not crowded. We arrive in Haldwani at 22:30 as planned. 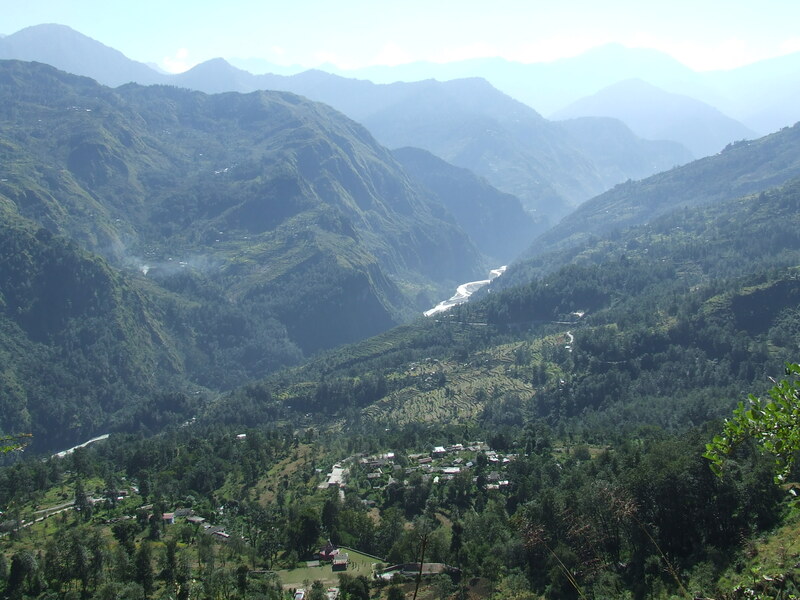 We are on the border of the plain and the Himalaya’s foothills. This is probably why the railway line stops there. A ricksaw takes us a few minutes to the bus station and jeeps. Despite the late hour, we are immediately approached by touts. One of them leads us to the driver of a jeep that leaves just for Munsyari. Some travellers are already waiting. They are happy to see new passengers because the jeep only leaves when the car is full. We go without losing time. It will be impossible to sleep during the second night of the trip. We are still in good shape when the sun rises and blushes the tropical countryside. We stopped several times to take a tchai at the roadside. We are nodding when the jeep stop at 8:30. The driver tells us that we are still 70km from Munsyari. However, he will not go on. He invites us to get into a new jeep whose driver tells us he will go at 10am for our final destination. The former one makes us pay his share, 650Rs from the 900 he wanted in Munsyari for all the way. But at 10:00, no new client is present. I feel bad the situation. We really need to rest. I negotiate with the driver a price for an immediate departure. 1000RS. What a luxury! A long bench for each to lie down. We soon get to sleep, not without a bad conscience seeing three passengers crammed in beside the driver. The air becomes cooler and we are seeing the first snowy peaks. We arrive at around 13:00. We are looking for a hotel, walking through the big village that is Munsyari. Finally, it is next to the bus station that we find the best one: Pandey Lodge (350Rs) with a great view of the Panchachuli range from the large bay window of the room. The boss tells us that there is no more authorization to be given by the police. A simple declaration just has to be made. We go to the barracks located few hundred meters from the hotel after a lunch of omelet, rice and coca. Formalities are completed in 5 minutes while we are on a Sunday ! The sun rises around 6: 30 on a clear sky. A light mist covers the valleys and marks the first rays of the sun. 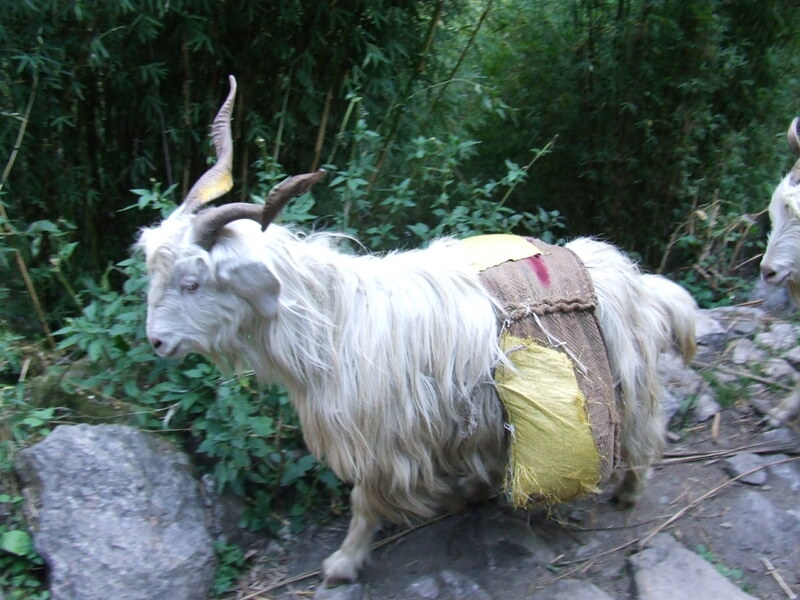 We have prepared a package of unnecessary affairs for the trek to let it in the hotel to avoid needlessly burden in our backpacks. We leave at 8:00. We have decided to walk from Munsyari because there is only 4.5km to the entrance way. A short walk to avoid additional transportation researches… We take the opportunity of crossing the village to buy a flashlight (80rs) because I broke mine during the trip. Points are carefully recorded in the GPS and we follow our route without difficulty. The path downhill often crosses the loops of the road. A woman stops us and tell us that the way to Milam is not in the direction we take and that the good track is overhanging. We do not believe her because GPS is formal in its indications. It must be a conspiracy to make us take a guide! 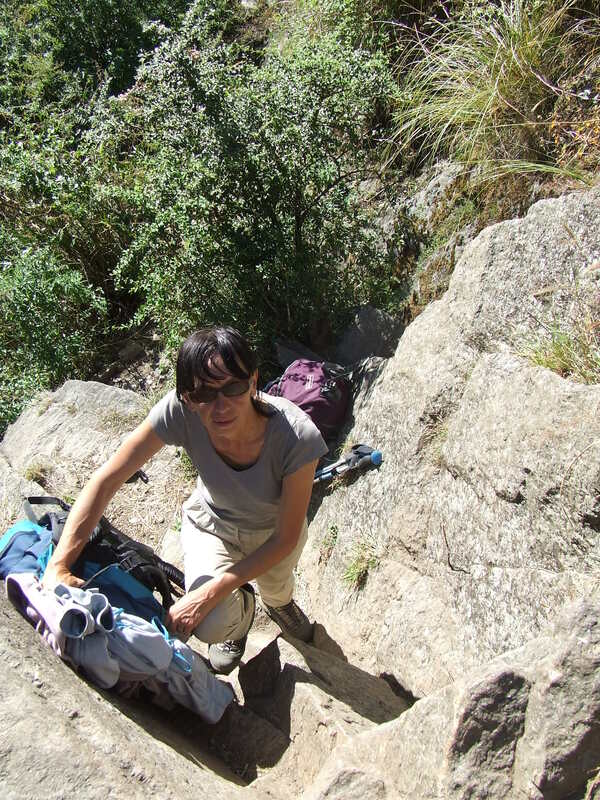 At 13h, as the path narrows and differs only intermittently, I go without backpack to explore the slopes heights. I cannot find anything and I come back, tired. After a quick picnic, I get carried away by the weight of the bag with which I’m not accustomed. I go out with a black eye that will not leave me for the trip. The left wrist is a little sore but nothing is really damaged. We continue until we hit a huge cone of screes cutting the road. The blocks are unstable and take their source several hundreds of meters above us. Nothing indicates a path overhead. I choose to explore the area without the backpack. Progression, even without the bag is not easy. 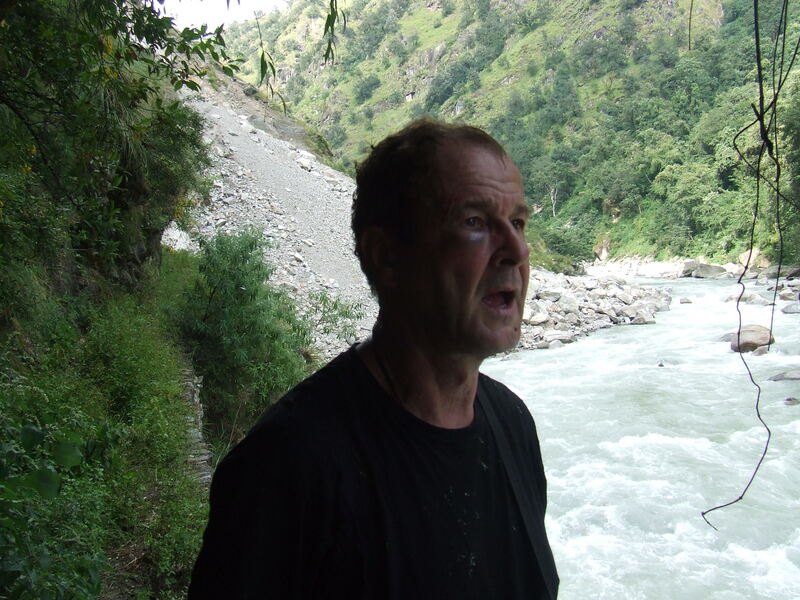 I find myself facing a vertical wall falling in the Gori Ganga, where I find an open gallery. On the other side of this gallery, a new cone of debris awaits us. On my return, however, we decide to try our luck. The advance is slow and cautious. Each stone can be a trap. 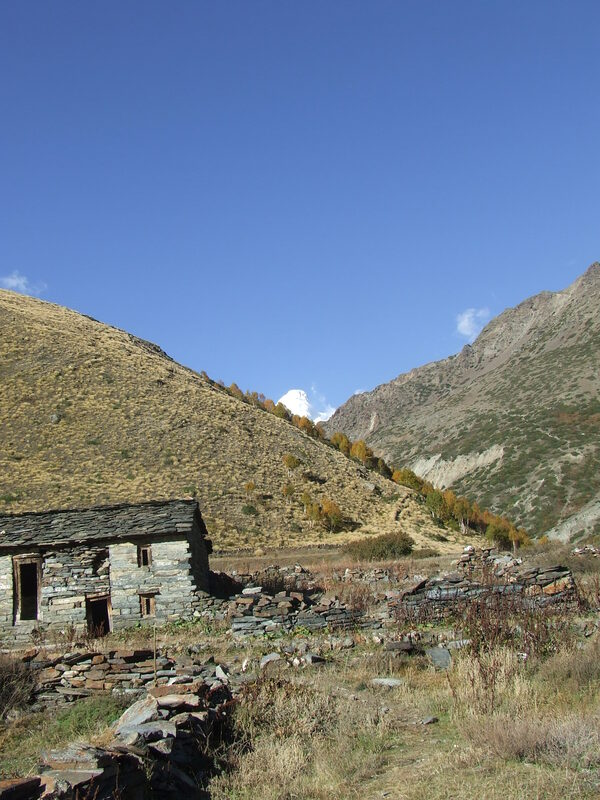 We find the true path to Lilam at above 16h, surrounded by a few inhabited houses. This hamlet has become a cul de sac and people look at us, surprised and compassionate. The track is increasingly steep but we are reassured. We arrive at 17:30, exhausted and unable even to enter in the village, we settle into the first guesthouse bordering the path. 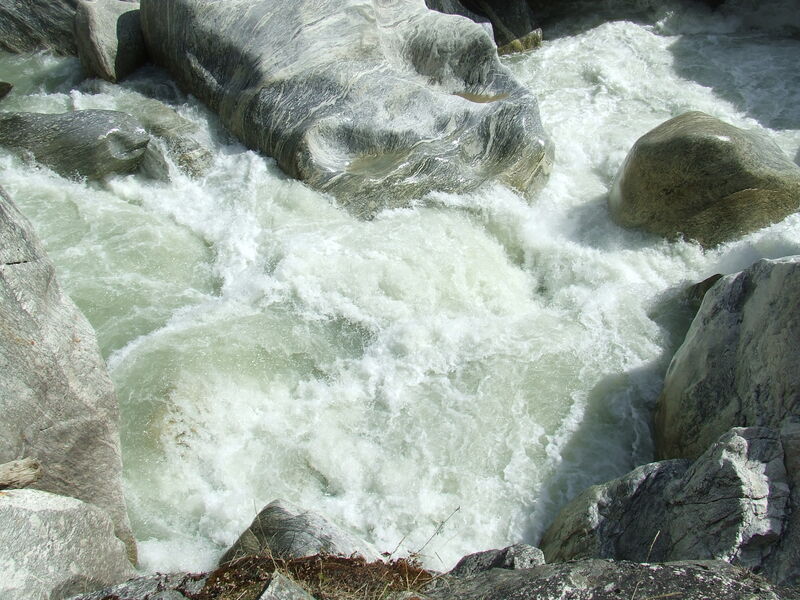 The water flows in abundance from rocks and our toilet with icy water regenerates us. Sylvie will be the victim of a greedy leech. Our misfortune is a serious warning: preparation at distance, however accurate, cannot replace local search for informations and news before leaving. The owner gives us a good dinner of chai chapatis omelette watered with a bit of local alcohol. We lie at 19h. Our lifes will be linked with the sun as there is not much to do in the dark and it takes advantage of the early morning, still the clearest period of the day. We sleep soundly. 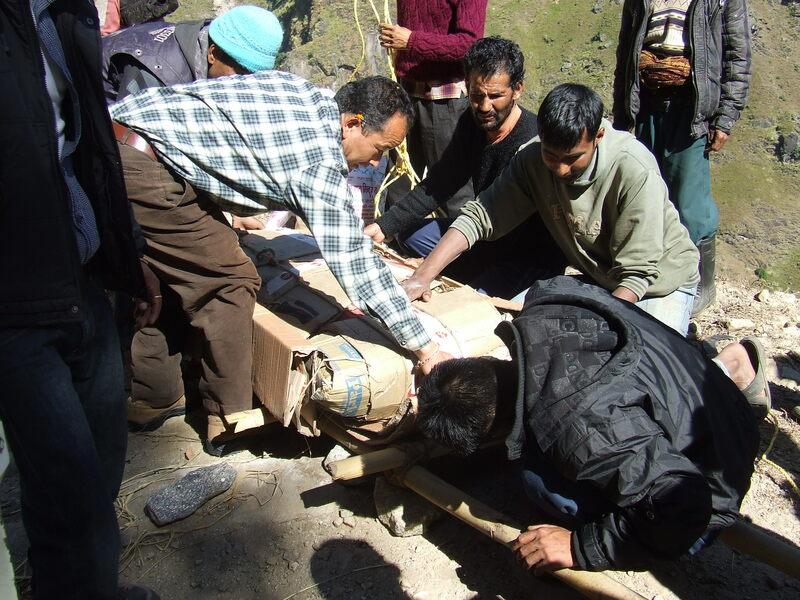 The use of bags and sleeping mats is essential because the bed is a set of planks. After almost 13 hours of sleep, our bodies have not forgotten the foolish efforts of the previous day. When we want to get up, our legs reject any effort. We stagger for several minutes before we can move in and go out of the shack. 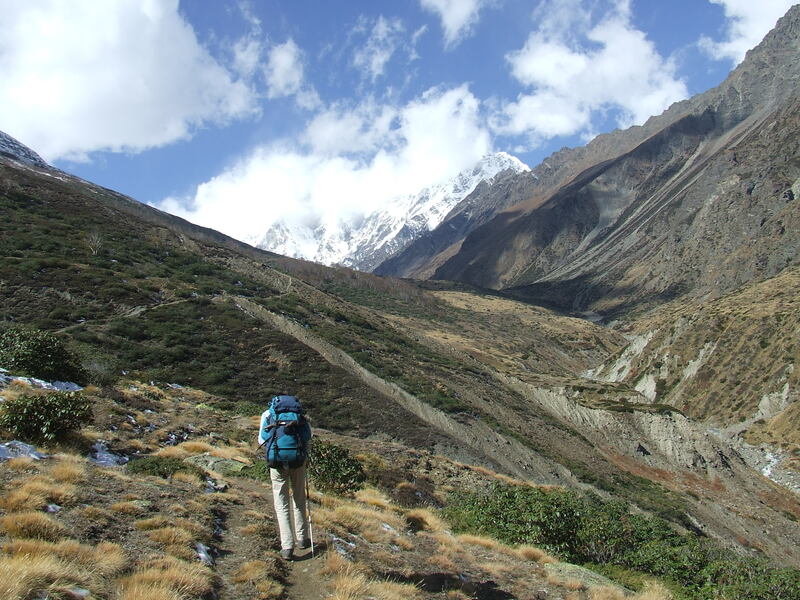 It will take two days to our bodies before they get used to the demands of the trek. It is 8: 00. The sky is blue, but dotted with some clouds. We do not start until about 10: 00 after breakfast (chai, chapati and omelette). We double the village of Milam quickly. If the GPS indicates a walk of 12 km, the real life will ​​learn us that nearly twice must be actually performed in difficult conditions. 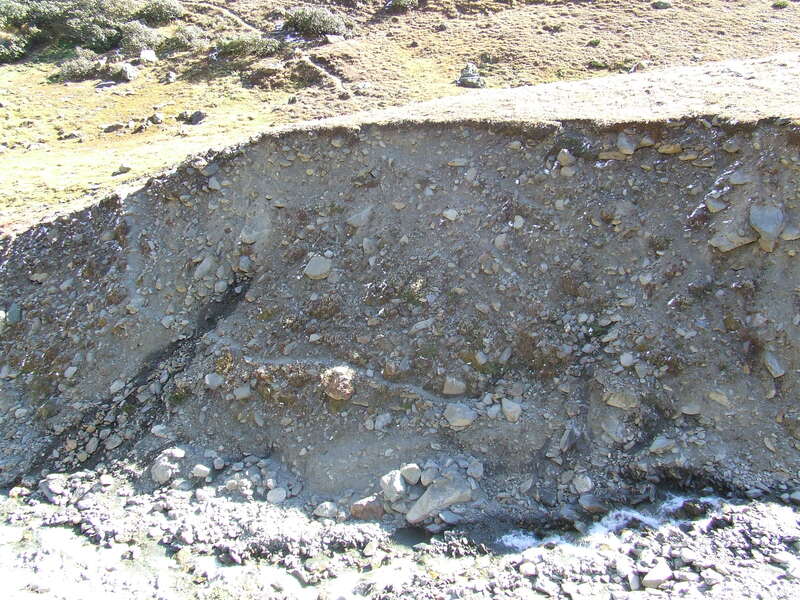 Indeed, the frequent landslides due to the verticality of the valley continue to destroy large portions of the path. 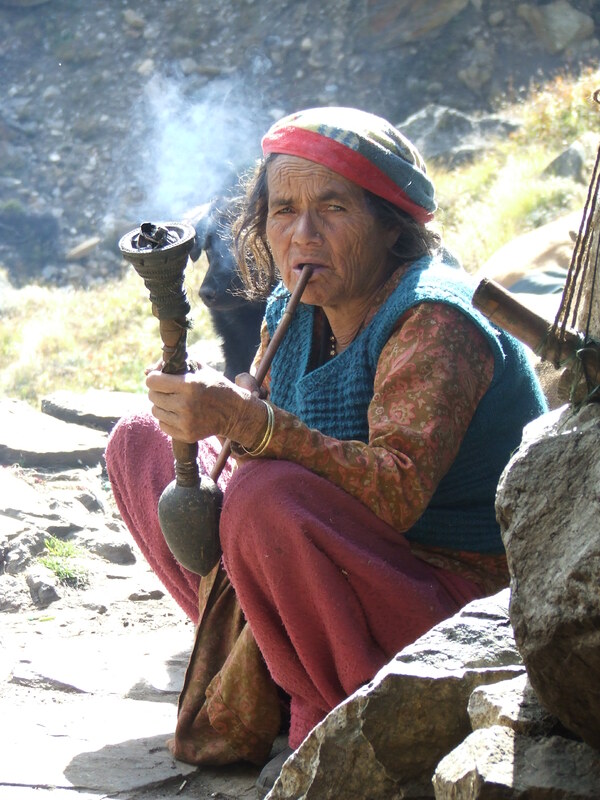 They are most often deflected by difficult climbs and descents on the still stable parts of the mountain. The notion of bird’s kilometer sees the day. And we would be birds to avoid unnecessary ascents sometimes requiring the use of our hands to go up! Because late departure and frequent deviations, the night comes before we arrive to Boudiyar. We stop in a place overlooking the Gori Ganga and sheltered from the wind. The first drops surprise us when we finish setting up the tent in a wall cavity. I just have the time to look for 2 liters of turbid water in the stream for cookery. The wood is abundant for the fire. The rain intensifies during the dinner (semolina, sausage and sweets). We see that the tent seams are leaking. The water pearl inside and pants Sylvie turned into mop. Bags and shoes are protected by their tarps outside. The rain thankfully stops at 22h. The earplugs come to the end of the roar of the torrent, thunder and the sound of the rain on the tent. We get up at 8: 00. The sky has been washed from clouds during the night. It will be a day of rest because we are close to Boudiyar. We take the time to dry affairs in the sun business and enjoy the scenery. We arrive at the village after an hour’s walk. We go directly to the barracks positioned at the entrance. We are welcome by soldiers who offer seats and water. The procedure seems poorly implemented or very recent because the military are hesitant. It must also be said that there are so few foreigners on the way: I note on the register only one passage per day in recent weeks. Anyway, we are far from recordings with mandatory photocopy of passport and announced confiscation of cameras. 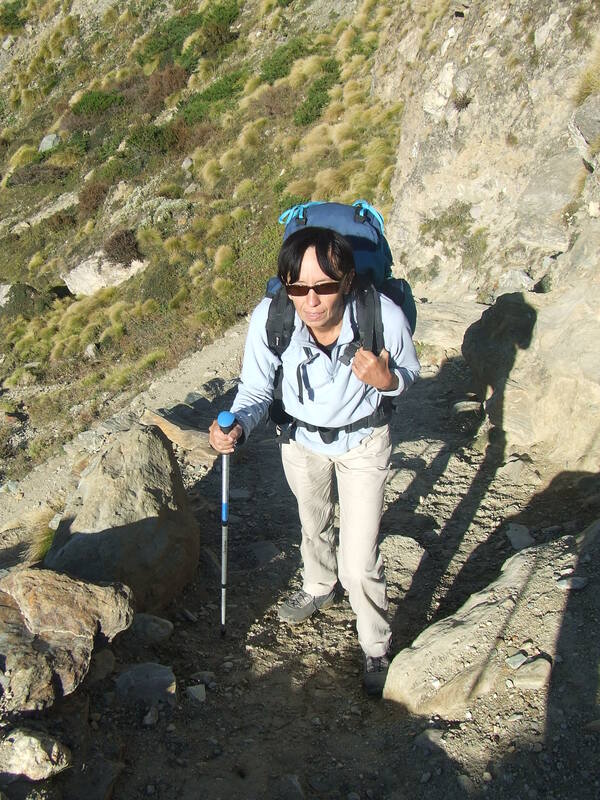 We have to investigate whether these flexibilities are implemented also for Sikkim trekking regulations (obligation to go through an agency, to be four or more trekkers, to have official guide mandatory with so many carriers and so on.) 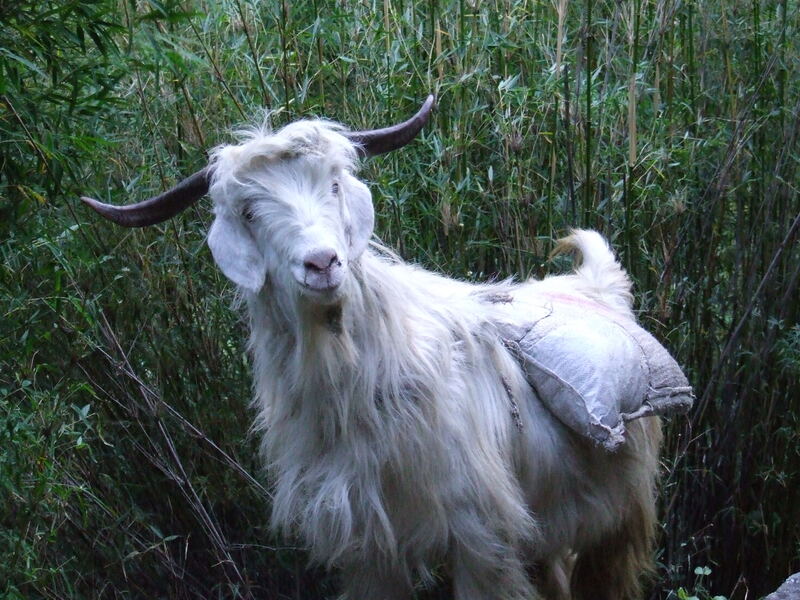 We never came to Sikkim because of these impossible regulations. 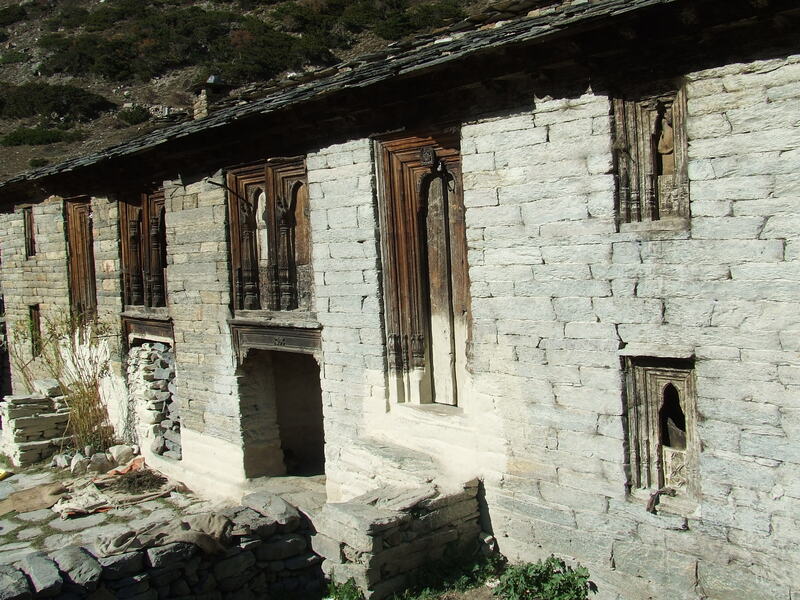 There is a guesthouse in Boudiyar, rustic and expensive (285Rs). The owner of the restaurant is very nice. We spend the afternoon sunbathe on the lawn. We make our first laundry in the brook. It’s been a long time that the noisy traffic of mule on the road separating guesthouse and restaurant started when we go out of bed at 6: 30. We let 4 kg of luggage including 500g semolina and books. We hope to be a little more comfortable in future ascents. The guesthouse owner asks us 300rs we negotiate with 100RS. We still have five days of autonomy, which is more than enough. 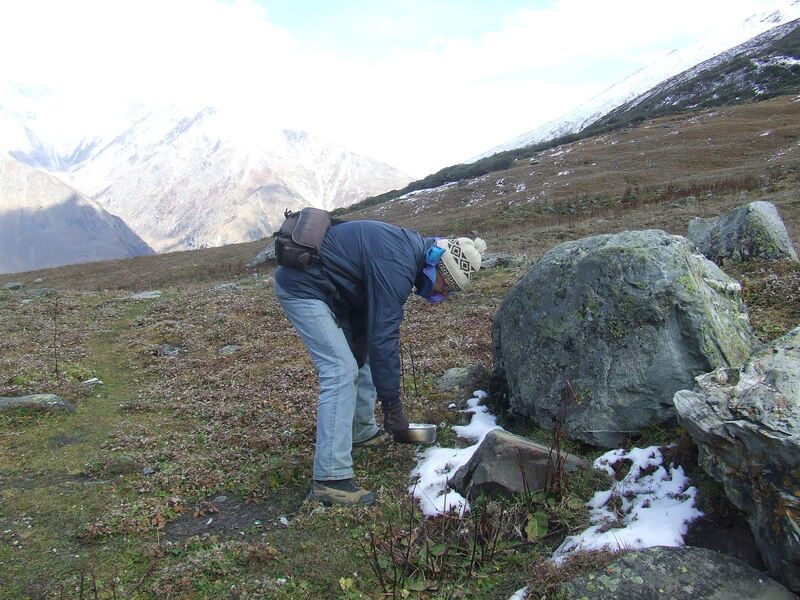 It is imperative to gain weight and to be more precise in the preparation of menus for next treks. 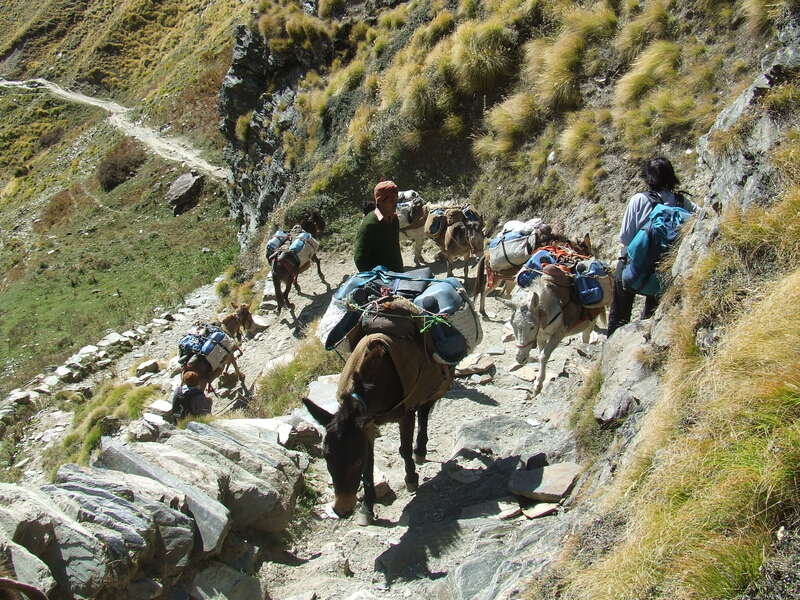 Muleteers offer us to take charge of our bags to let them at Rilkot for 300Rs. We refuse. We’ll see how far we can go on our own! It is a beautiful time and we walk a lot better. We religiously open Bayonne ham and Comté for lunch at a shepherd hut where we order tchai. They will be tasted with 5 chapatis taken in Boudiyar. 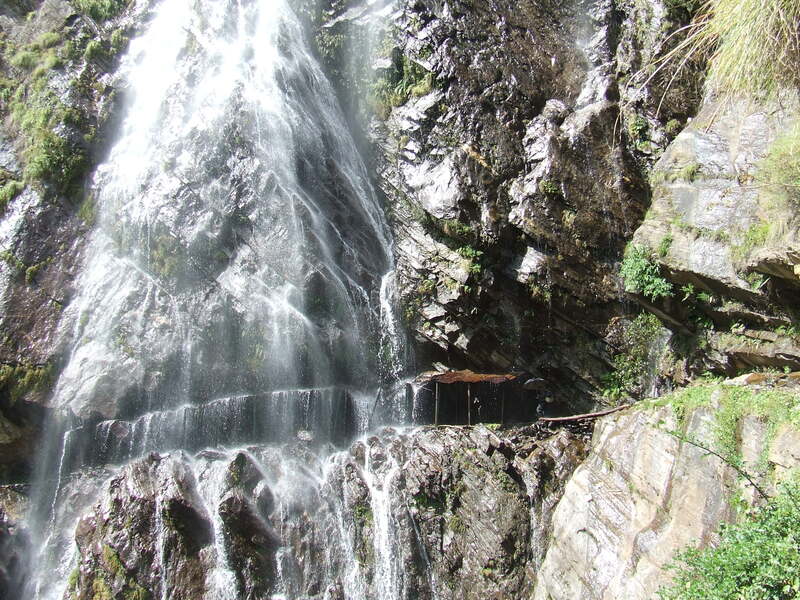 We go through extraordinary gorges where a wonderful location for camping is possible (30 ° 14’8 .79 « N – 80 ° 12’57 .04 » E). Returning, we will stop there for a night if possible. 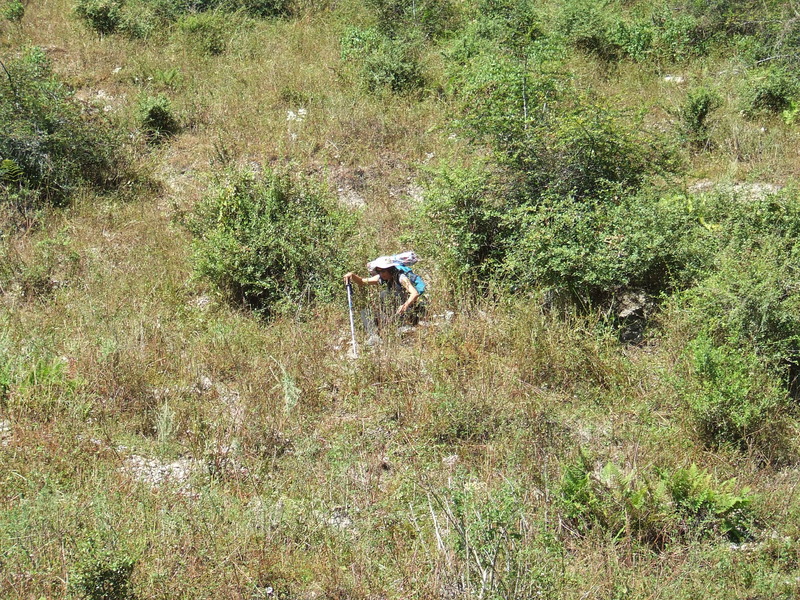 The environment has changed from the tropical vegetation to conifers and pasture when we arrive in Railkot 16h. 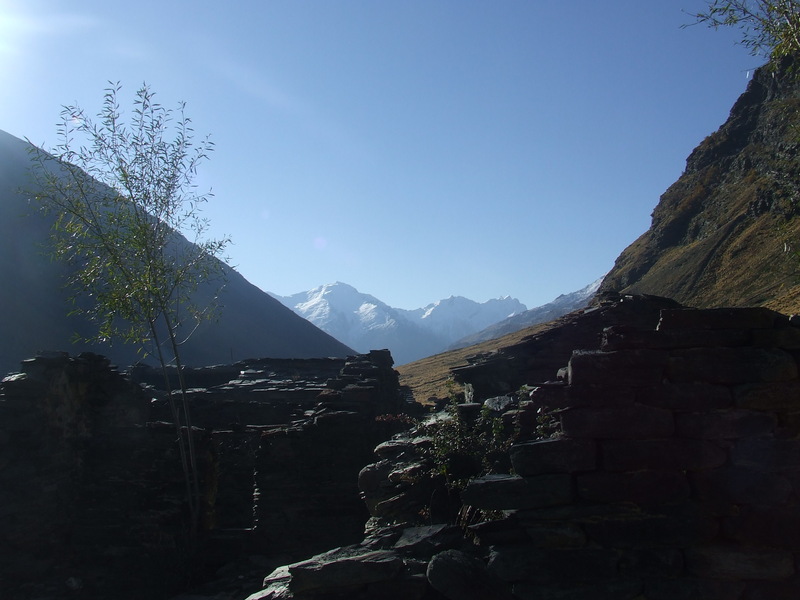 Railkot is abandoned by most of its inhabitants, permanently or for the winter period. Two out of three families have already gone. 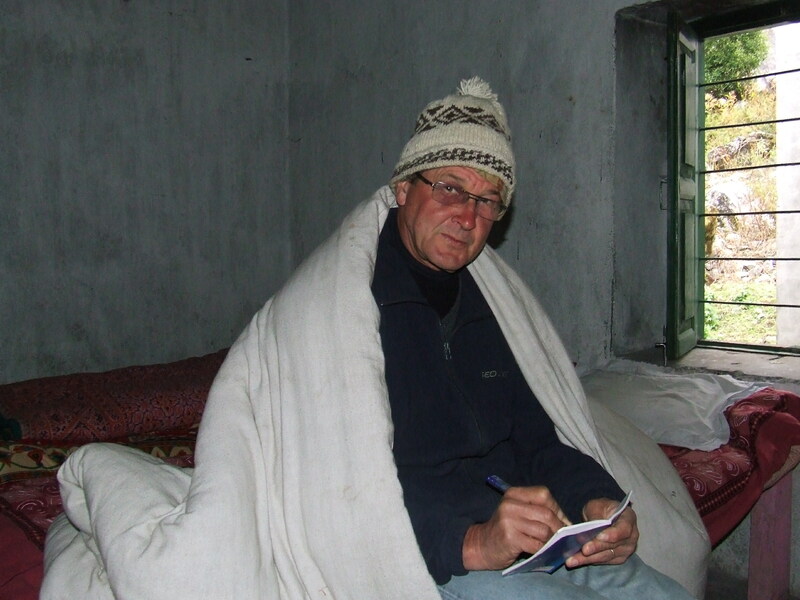 We are fortunate to find someone who offers rice dal vegetables and a place in his attic. We share it with an old Indian and some large mouse that preys on our backpacks. We wake up naturally at 5: 30. We are now in line with the sun. Our host does not really want to serve chapatis for breakfast. This will be a spicy Maggi. Must be adaptive! We start at 7: 15 without being able to freshen up: there is no water. 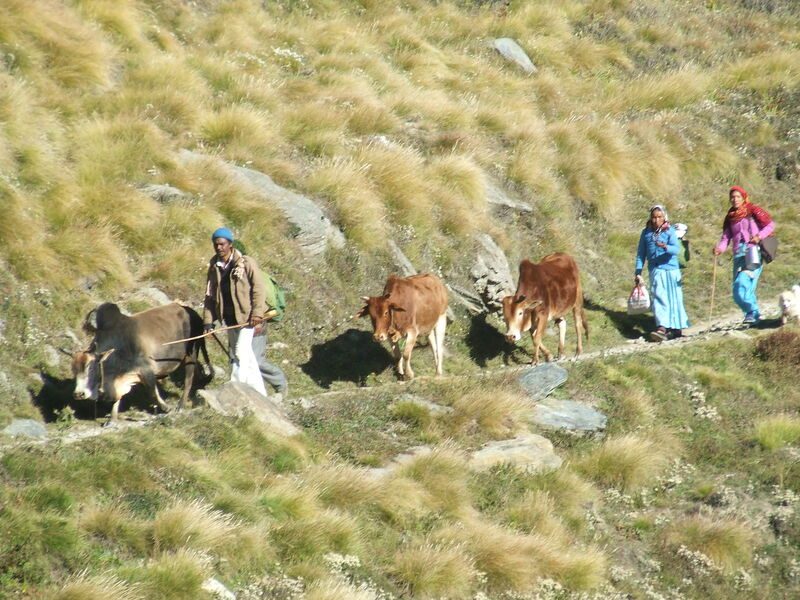 On the way, we bump into one of many families who settle in the lower valley during the winter. Who will be there when we arrive? The path has become easy because the valley widens. We even meet a bulldozer! This is surprising and we must believe that local authorities want to turn the mule track in motorable road? We are concerned by the sky. The clouds have piled up quickly on the northern ranges . The sun is not strong enough to warm us when we stop. 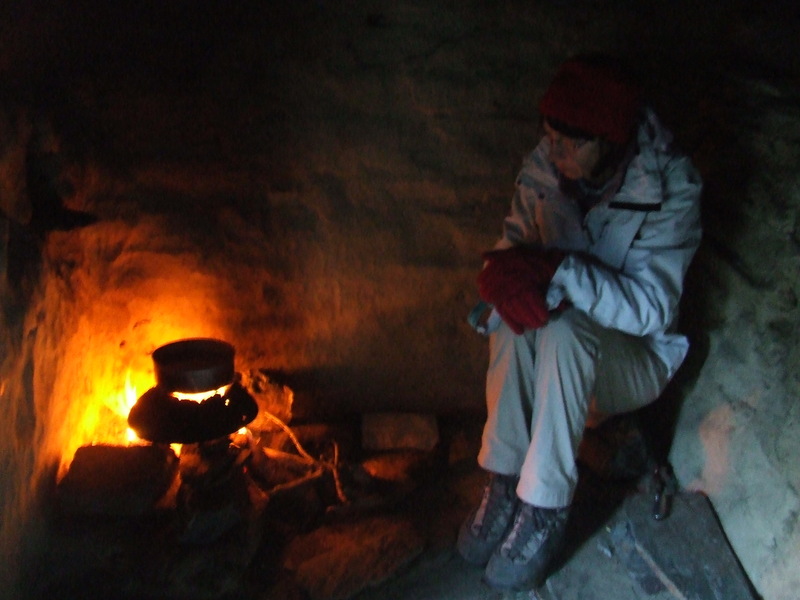 At the level of Burphu, at around 10: 30, we take lunch in a small and friendly hut. 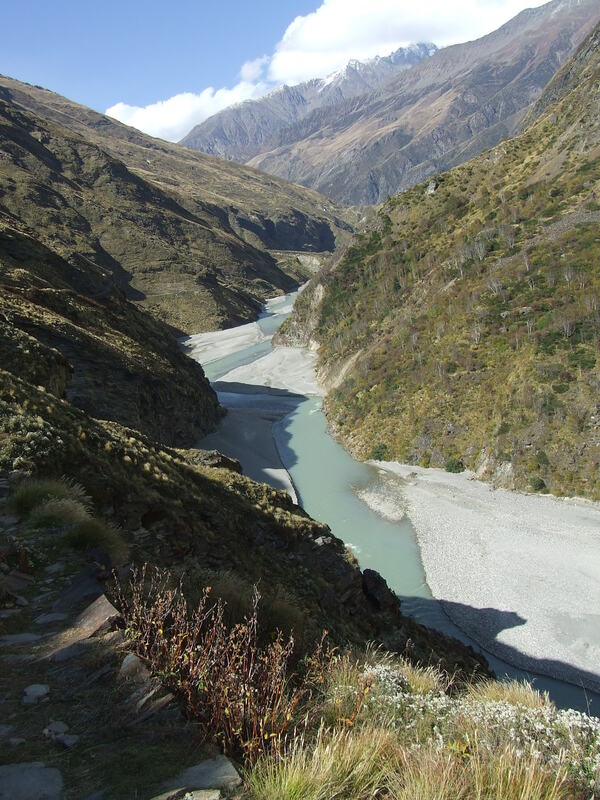 This is our last civilized point because we will separate from the main road on the left bank of Gori Ganga, staying on the right side to reach the valley glacier of Pachhu. On leaving, the owner pursues us because he is afraid that we’re taking a wrong track! We lose a little in the fields but we arrive at Ganghar at about 15h after passing through two abandoned and walled houses villages. Bad weather prevails in the lower valley and the cold wind pierces us. 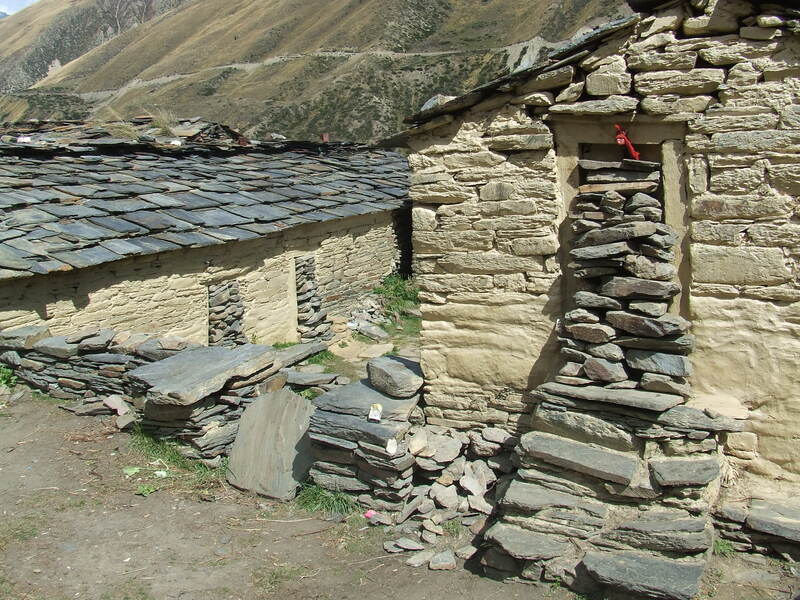 The village was completely abandoned by its unhabitants as we expected. We sit in what can be described as the central square of Ganghar (30 ° 24’2 .38 « N – 80 ° 9’15 .00 » E). The water flows from a tap in a small fountain. Handy! 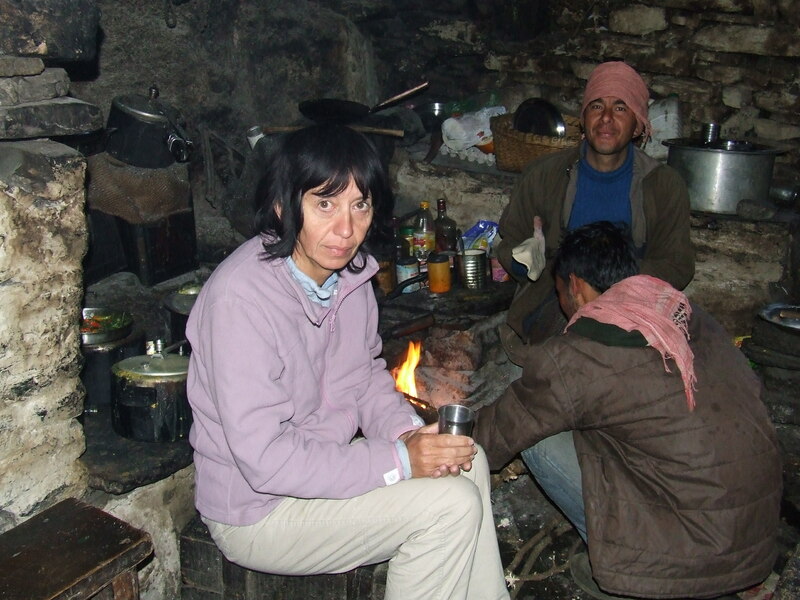 We are looking for firewood and we place a refuge in a small stone building to shelter us from the wind. The wood does not fail. The collapsed structures provide us with dry birch branches. Following the installation, we explore the hill to find the entrance to the path that will lead us tomorrow at the base camp of Nanda Devi. 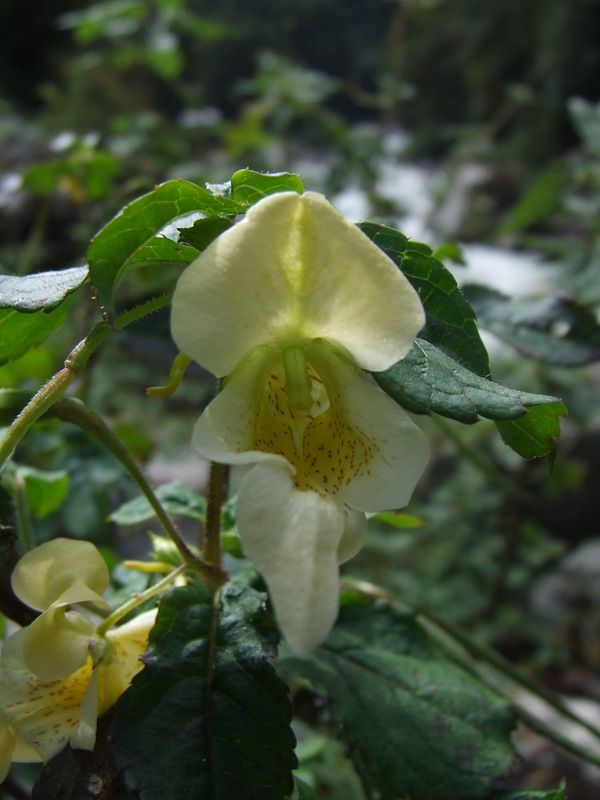 We find it easily behind a small temple. It is a chance because we did not find any sign of it in the satellite photo of Google Earth. Snow falls softly when we light the fire at 16h. We prepare a tea to warm us. The night is cold and long. The two sleeping bags have been linked together. But the cold awakes us regularly. The sun rises at about 5: 30. The tent walls are lined with a thick layer of ice from our breaths. It falls in fine particles on our frozen faces. We are not starting before 8: 25 because storing the package took time. The path on the right bank we could also theoretically take seems more direct but also more dangerous with unstable screes. 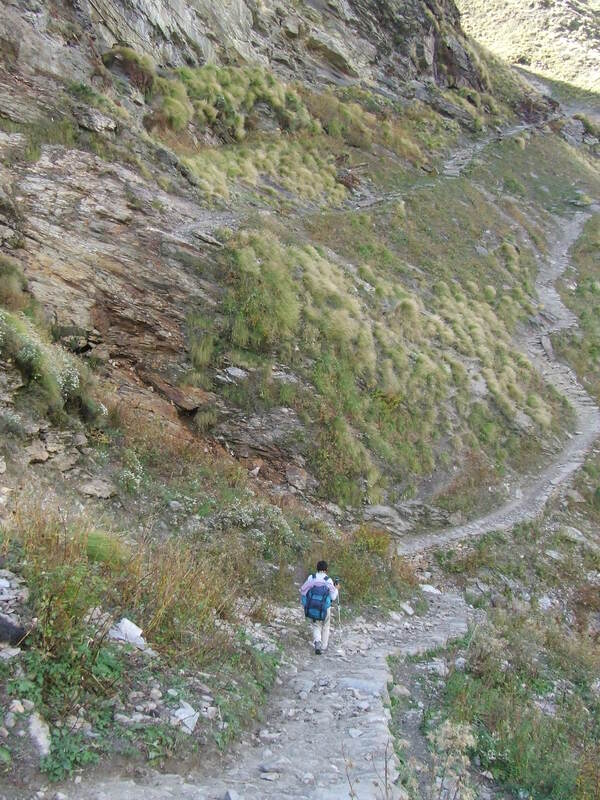 We don’t regret our choice: our way is very steep but correctly marked. The snow appears on the trail. We see a lot of traces of a big plantigrade. They are as wide as my shoe print and twice shorter. Sylvie is afraid and wants already to go back. We have a strong feeling of isolation here. 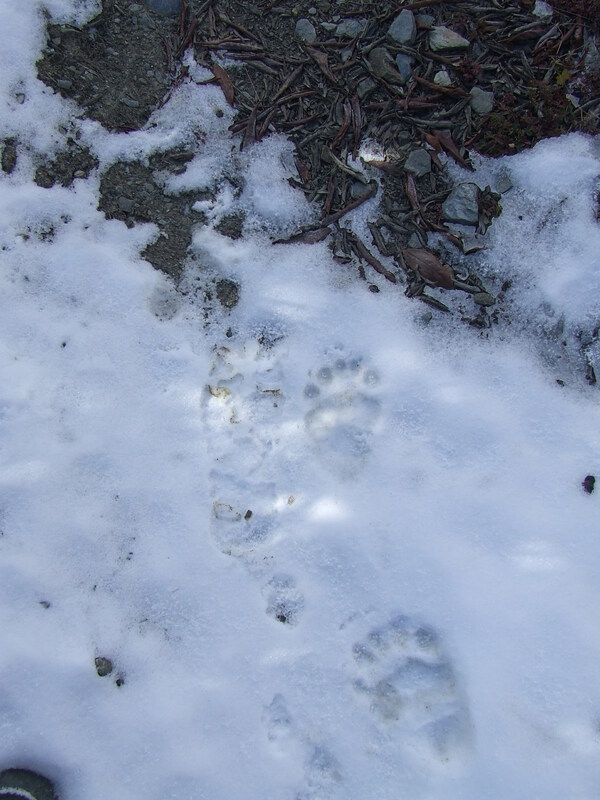 In the description of the area, I only read the presence of the snow leopard, harmless and endangered. It seems to be from a biped. It should not be a bear because we do not see a trace of claws. It would thus be a child yeti? Sylvie is not more reassured, but we continue. 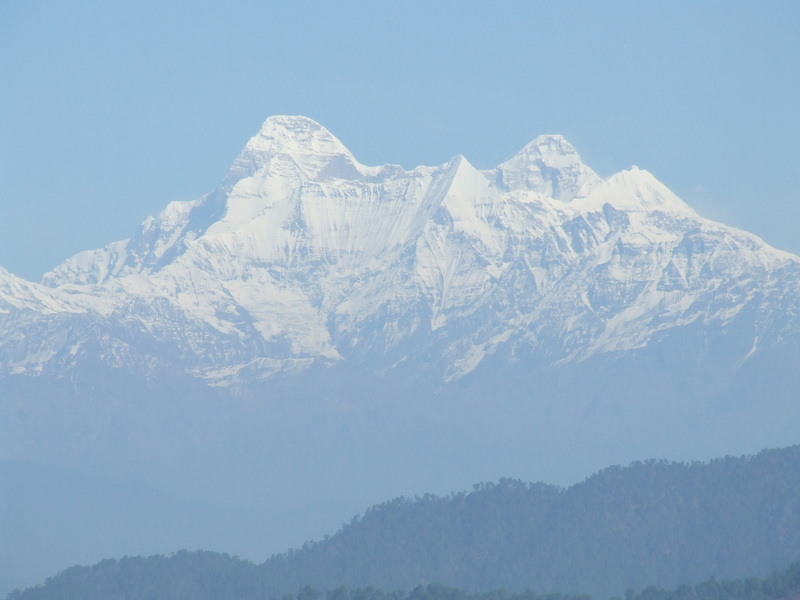 Meanwhile, the clouds collect on the Nanda Devi massif. 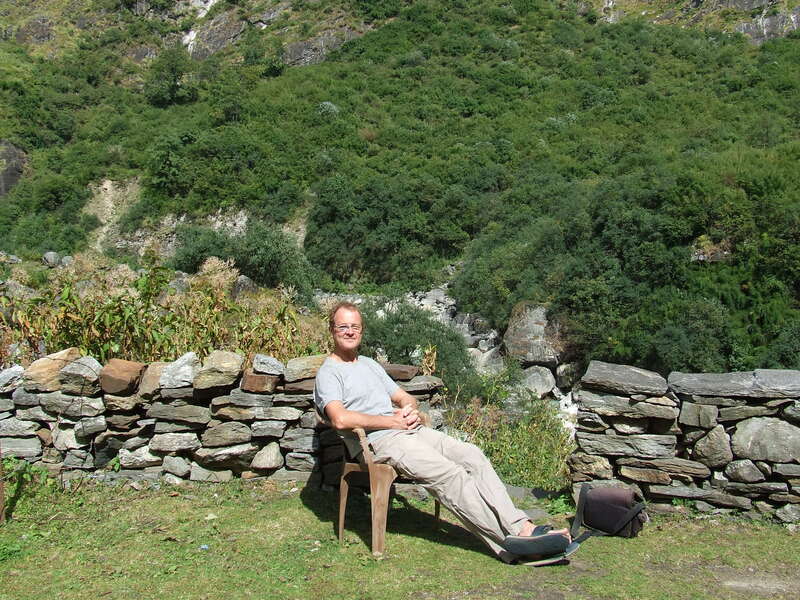 We arrive at 12: 15 on the plateau overlooking the Nanda Devi’s glacier. 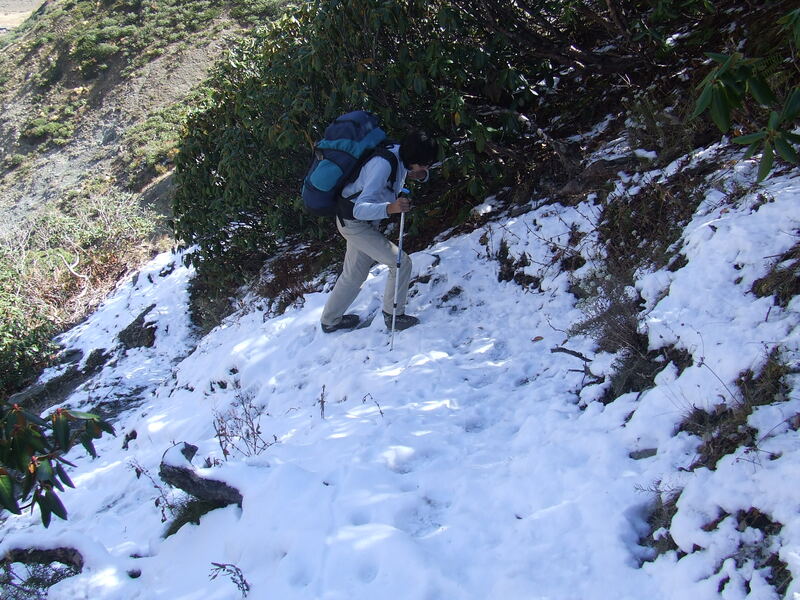 At its limit, an avalanche trail dug deep furrows, difficult, maybe impossible to cross with our backpacks. We decide to stop there. 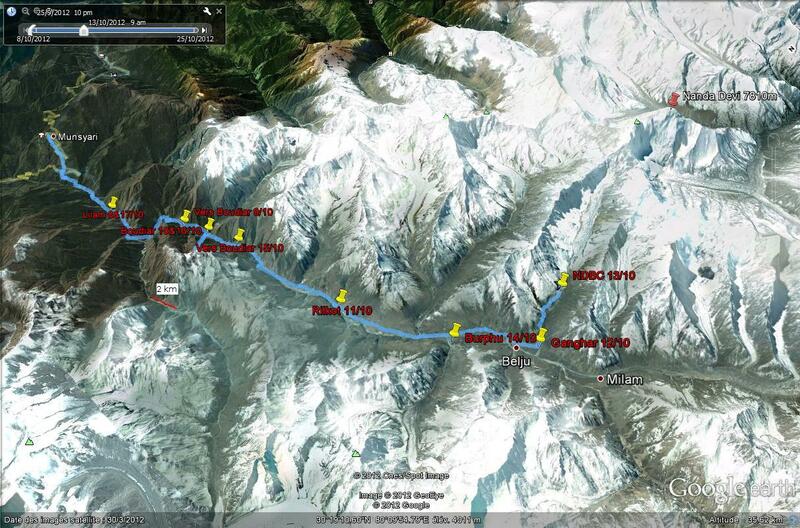 We are 1 km from the base camp. We set up the tent in the last groves of rhododendron (30 ° 23’28 .78 « N, 80 ° 7’1 .81 » E). It must be beautiful in the spring. Dead wood is abundant and we have no difficulty in raising enough to protect us from the cold and for the cookery. We get the snow with a spoon to melt it because there are no water sources here. The night will be difficult with our not too suitable equipments. I have 6 superimposed clothes layers. We are trying to protect us with survival aluminized blankets. Nevertheless, we shiver all night! 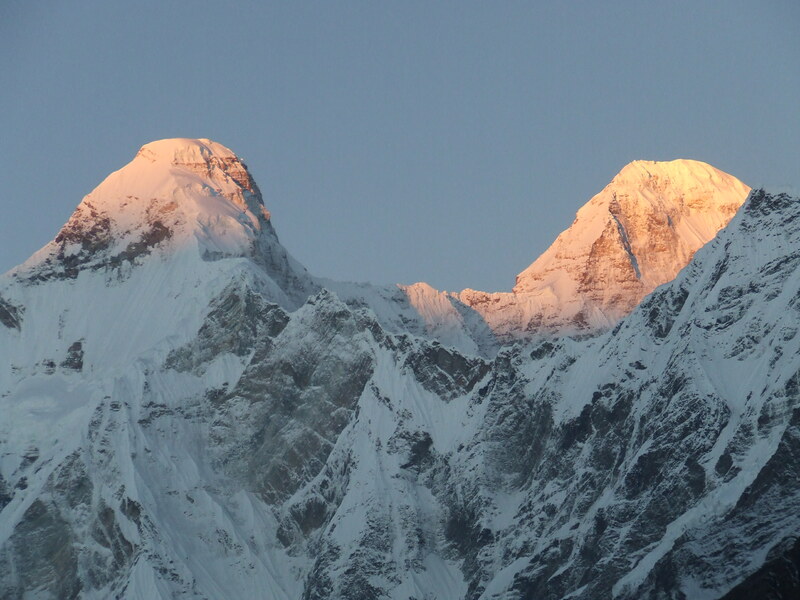 The wake up around 5:30 rewards us for our efforts: Nanda Devi is revealed in a clear sky at daybreak. It occurs first in shades of gray and dark blue then domes become golden in the early sunlight. Finally, masses glitter with contrasts of white, gold, blue and black. We are stunned by this so awaited show. Breakfast will wait! We are rewarded a hundredfold for efforts of previous days and nights. We leave at 9am to Ganghar. 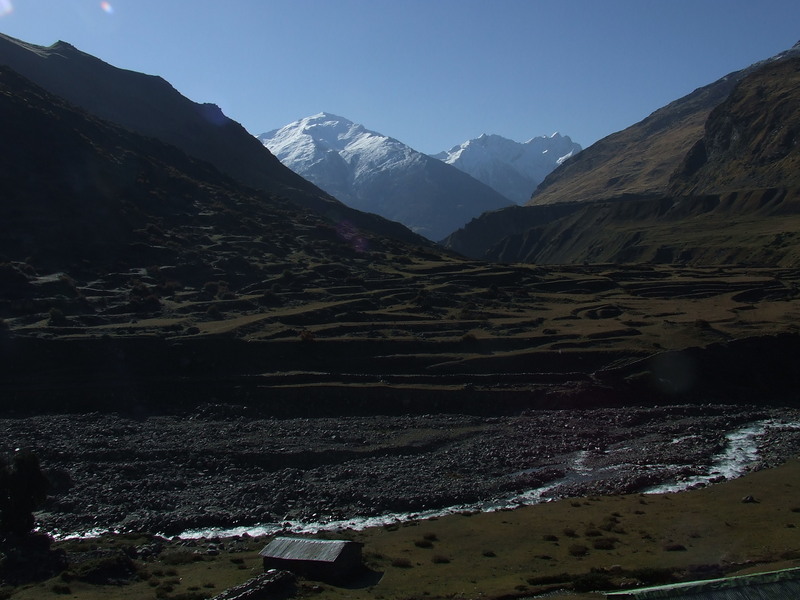 We decide not to continue to Pachhu then to Milam glacier because we think we have sufficiently suffered from cold. 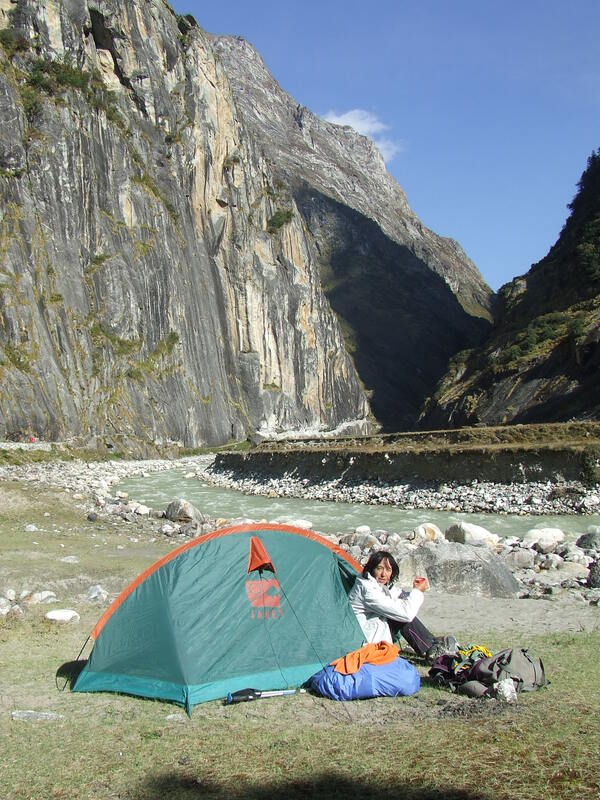 We have fully filled our main objective by camping at the foot of Nanda Devi. We strive for a minimum of comfort for us to recover from the ordeal. 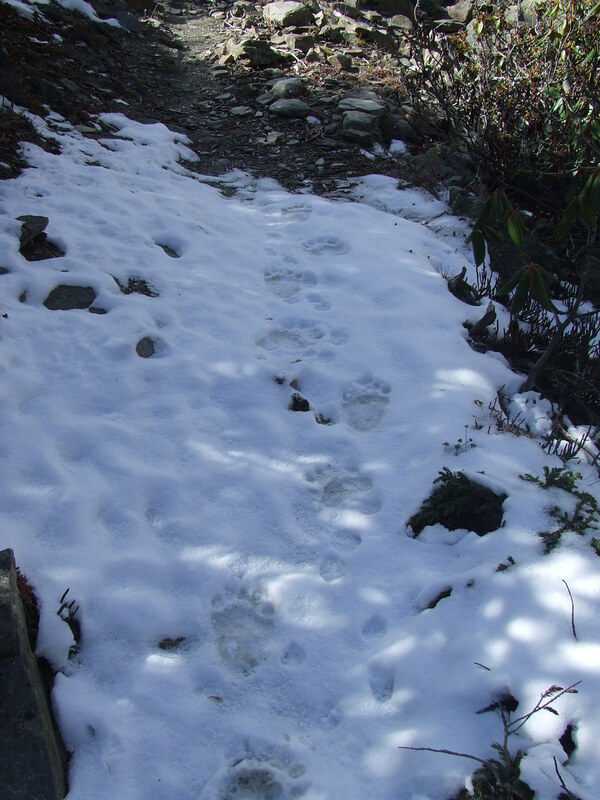 We miss a step adventure on tracks that may be erased, and on crossing a glacier that may be impossible but certainly for new incomparable shows. This is certainly what is called wisdom. 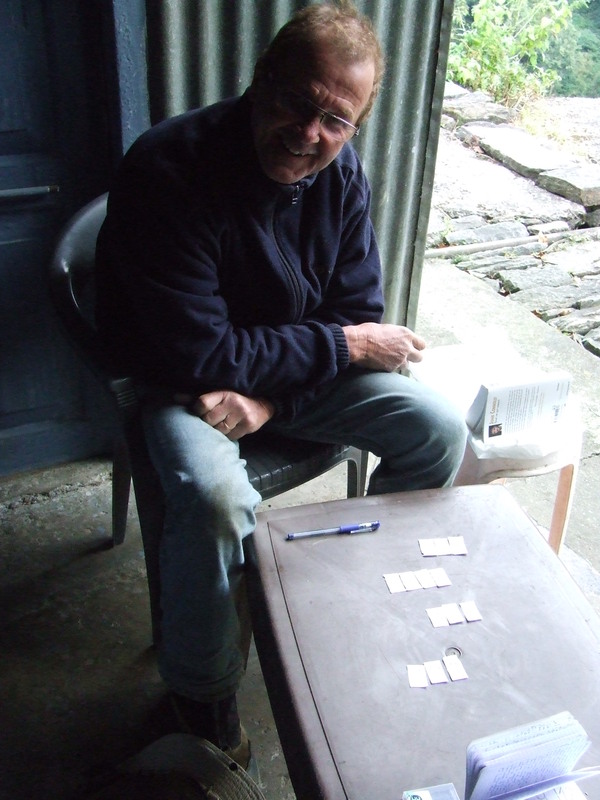 Revising our agenda allows us a day of rest in Almora. 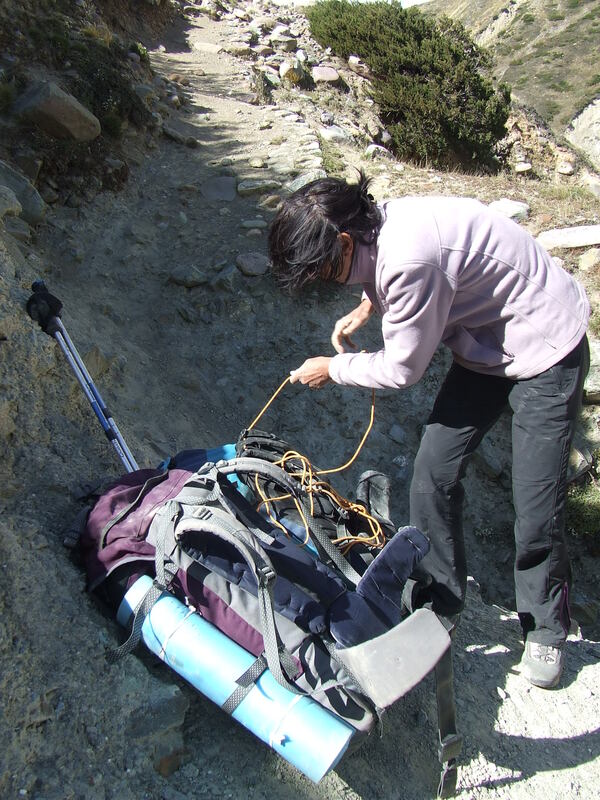 The equipment is essential to advance properly at high altitudes. 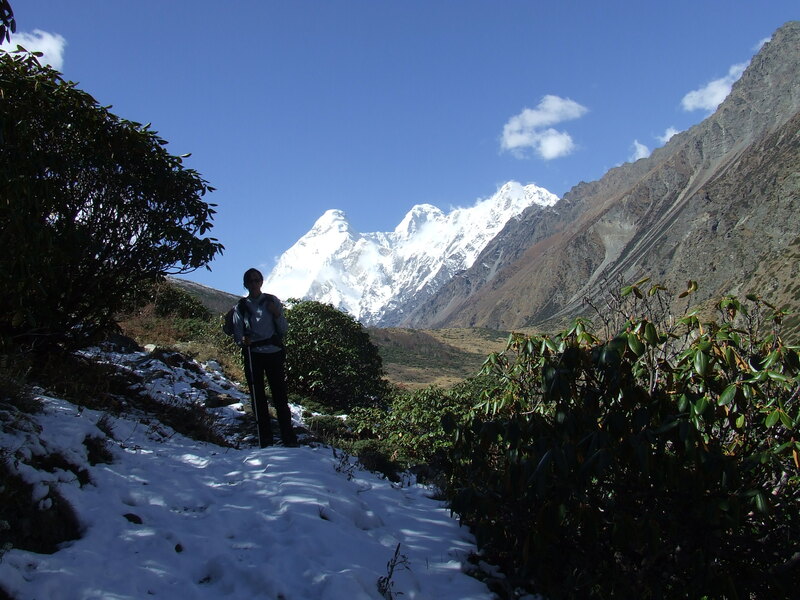 We will review uncompromising before the next trek, probably to the Makalu base camp. We have to resolve the paradox between the weight and the quality. The view is much clearer than yesterday and Nanda follows us down. The arrival at 11: 25 allows us to wash in the site of the former camp and lunch quietly. We have still in profusion valuable Bayonne ham, chocolate and Aldi’s Comté. We lack a bit of bread. It is a strange feeling to be alone at the heart of this abandoned village, to be for a few hours its only inhabitants. We choose the low road rather than the high one where we were a bit lost on the way. The path is clearly crossed by a few stones, indicating a dead end. We hope to overcome difficulties because we are lighter than convoys of mules! All goes well until the track disappears into the void. We decide nevertheless to go on. Letting our bags, we go sticking to the wall. The exercise is relatively perilous. Sylvie goes to a wrong point at some moment and difficultly turns back. 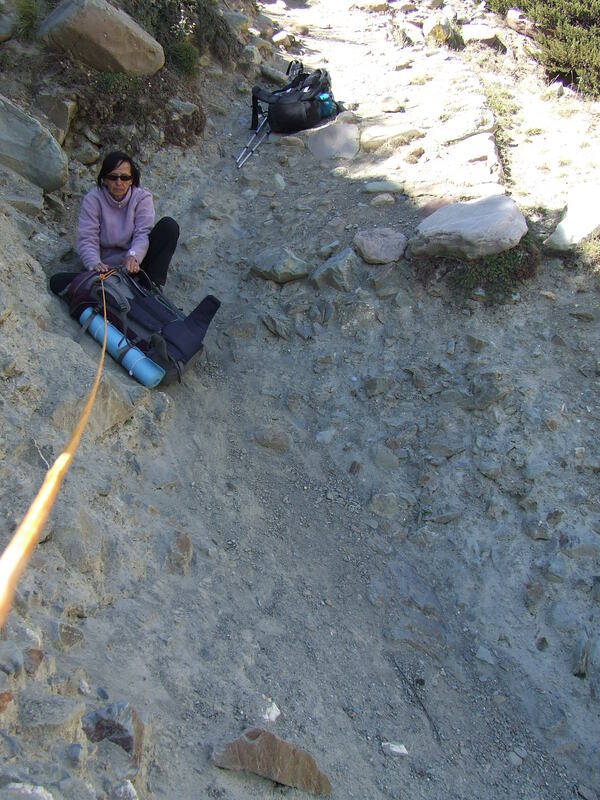 The rope is a very useful element in this trek! 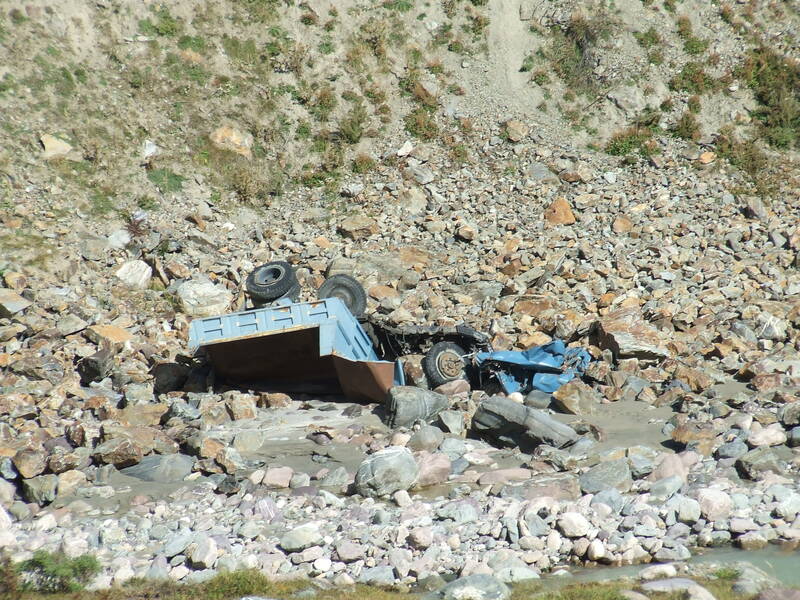 A truck strangely crashed into the ravine while there appears to be no road … Is the military’s intention to make a road, but to where? There is nothing strategic in the region unless to reopen the border with Tibet and seeming India’s irreducible enemy China. They descend to Munsyari for 6 winter months, on November 10. They will return to Burphu in April. 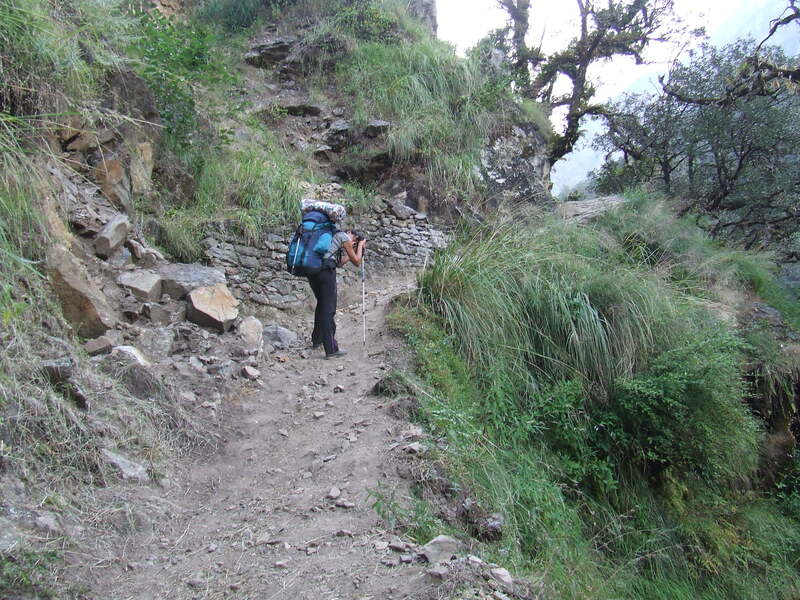 It is in the course of this month a trek can arranged, well before the first monsoon rains. It is good to know! Warning: in many guesthouses, there is no blanket. Even without the intention of camping, it is important to travel with a good sleeping bag. We start at 8: 15 after a breakfast of roti (chapati with butter) well watered with tchai. Lila has prepared four chapattis for our lunch without being asked. We reach the river outside the village for our toilet because the water is supplied by jerry cans in homes. The road becomes more difficult because of the ups and downs bypassing frequent landslides in the hills in the valley becoming very deep. In fact, the path becomes longer and more difficult with time. The several thousand year old Milam trade track degrades over time. 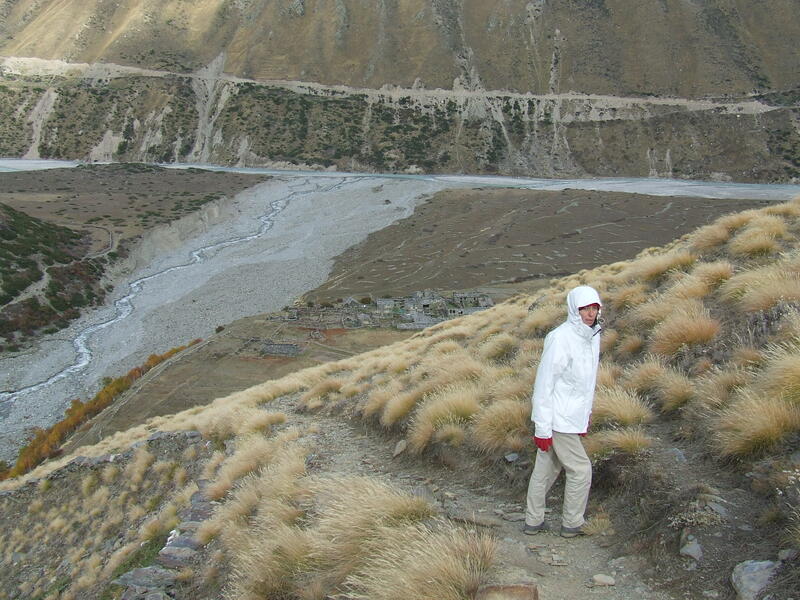 If the military road is built, there will be no problem but the reason for the trek will disappear at the same time! But night falls quickly and we set the tent in the dark. I found plenty of wood carted by the Gori Ganga but it’s now too dangerous to take water in it. I build the fireplace in a corner to be not too visible because we are totally alone and I stay impressed with the big ax. 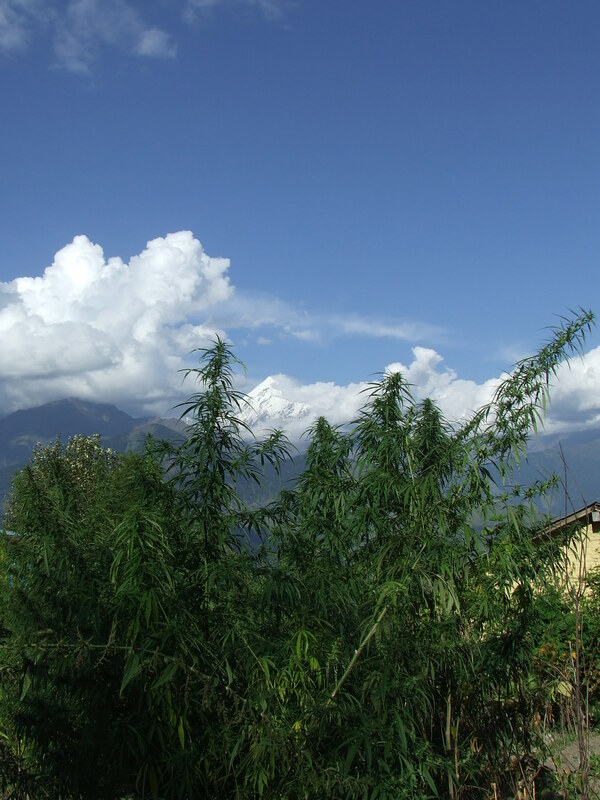 it is 10 °C higher than in Burphu here. The heat of the fire penetrates us enough for a comfortable dinner. We go to bed at 19: 30, crushed and fascinated by the verticality of the place. I wake up with the sunrise but I stay in my bag, hoping the arrival of the sun as it blows a cold wind outside. It seems that it will never come to the camp instead. I finally go to start the fire and prepare breakfast. I get turbid water in the Gori Ganga. The water is really cold. Fortunately, the sun has come and I dry myself with delight on the burning sand. We enjoy the spectacular sight of these gigantic mountains licked by the sun, these corridors dug by the hand of man since immemorial times. Everything seems simultaneously massive and domesticated here, created by giants. We find here and there delicious raspberries that bring us vitamins that we lacked since several days. We don’t leave before about 10:40, our record: we are close to Boudiyar where we will stop for the next night. We walk to a lighter step and jump from stone to stone rather than stumble over them. Is it because habit taken on chaotic paths or lightweight bags? We reach Boudiyar by browsing 3 km an hour. A few drops of rain begin to fall when we find our favorite restaurant. We also find our bag. We will give much of the food because these provisions are useless in Munsyari and more in France! Sylvie invents the world’s smallest pocket Rumikub by cutting squares of paper from her notebook. We will spend very good afternoons’ ends with this game! We reach the kitchen just after two Rumi parties to warm the fireside. We are not the first.We spend a great evening with the mule owners with a meal of rice, vegetables (sibzi for Turkish sebze surely!) and dal with a very little local alcohol to avoid headache. The atmosphere is cozy. We are lulled by the gentle and joyful conversations that we do not understand a word. When I wake up, I stagger, and this time, it’s not caused by forced marches. The alarm rings at 6: 00 but it’s a good half hour that we were awakened by mule owners commanding loudly their animals. We start at 8h under a perfectly blue sky but it will take a long time to be warmed by the first rays of the sun. Sylvie falls at the third running hour. Tired, she did not see that there was a vacuum along the path overlooking the ground of more than one meter. She falls into the loose soil and is more scared than hurt. She could kill herself. 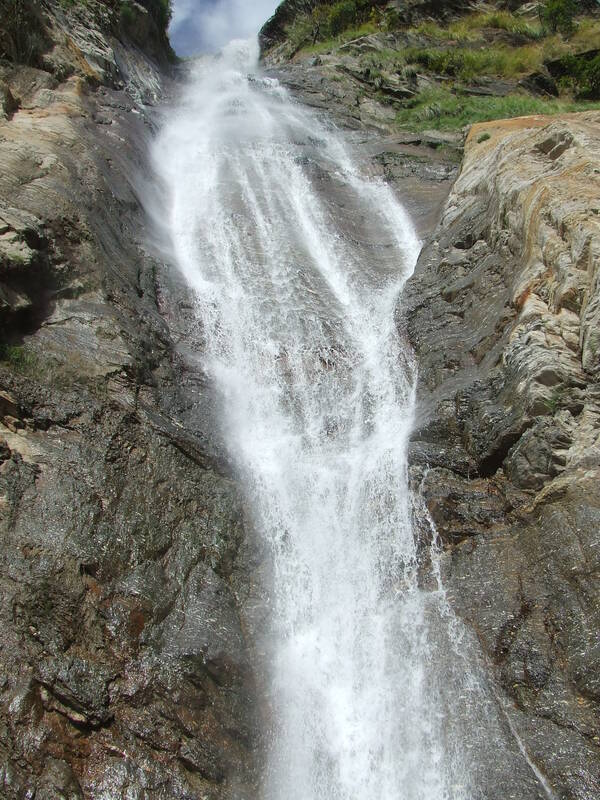 This is the second fall in the trek. 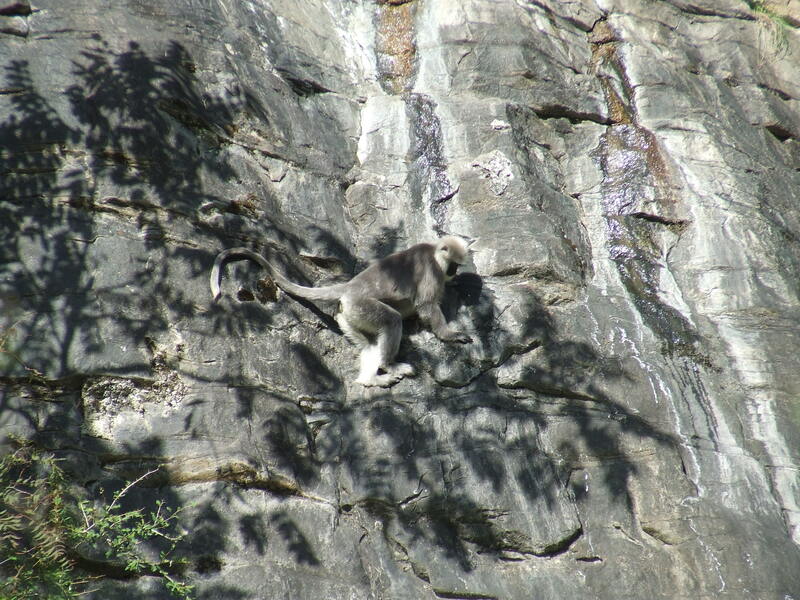 Shortly after, we see beautiful white gray monkeys clinging to the mountain wall. This is not a mirage, we really join the tropic regions. 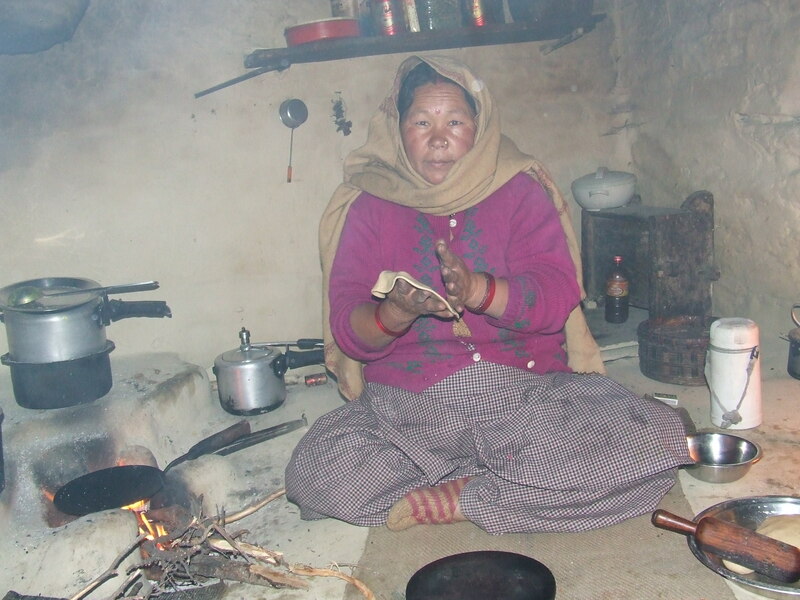 We decide to stop for lunch in their company, near a hut where a grumbling boy serves us tchai. 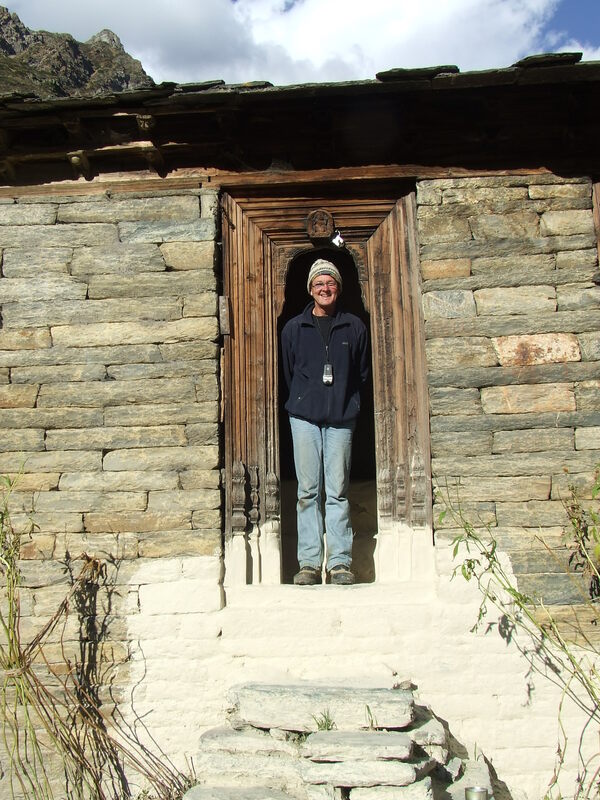 We meet the second tourists group from the beginning of the trek, three Anglo-Saxon women accompanied by their guide. We will see their carriers following with a heavy caravan of mules. 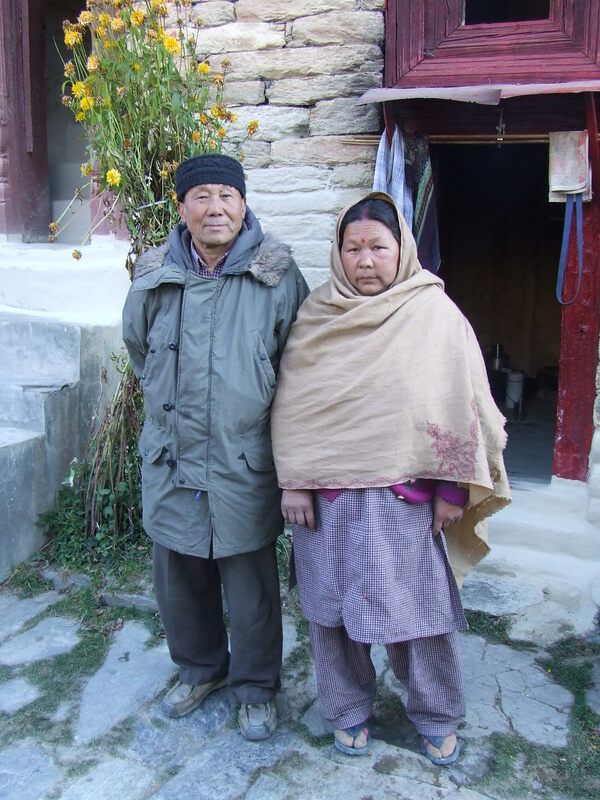 (We also met a couple to go traveling our way up to Martoli). 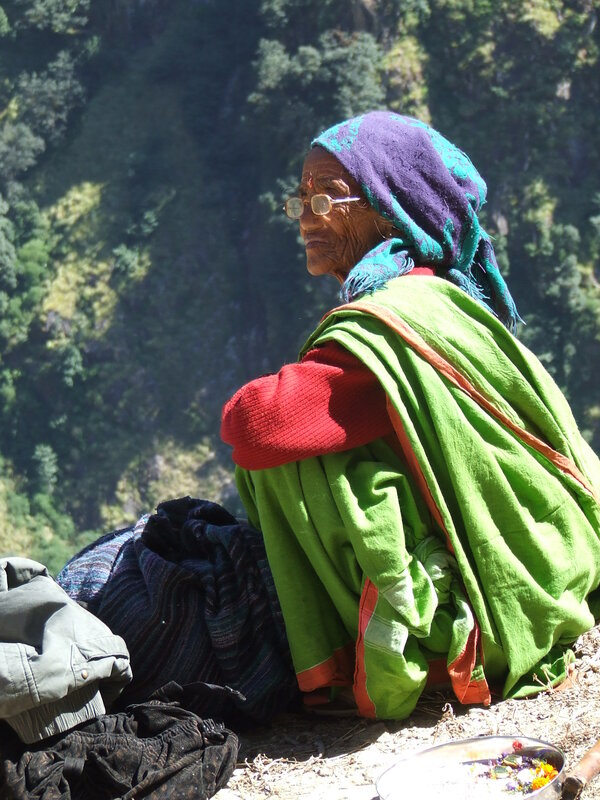 We are far from the valley of Kumbu’s congestions of trekkers! We arrive at about 15: 30 to Milam government guesthouse which is already closed for winter. An inhabitant offers us a nice room (285Rs) and food. We sleep well but are awakened by repeated blows in the door at 2am. No voice. I dreamed? I imagine a thief trying to enter into our room. Then footsteps spread on the roof. This is surely a monkey or a (very) large rodent. Sylvie, courageous, finally sent a furious blow with a stick in the ceiling. The individual flees without asking for his rest. Breakfast consists of delicious potato chips with chapattis and tchai. It cost us 250Rs for dinner and breakfast. The last part of our journey consists as usual of steep ascents and descents which make pester Sylvie. We ask people we meet near a bridge, from which the deviation starts towards Darkot. 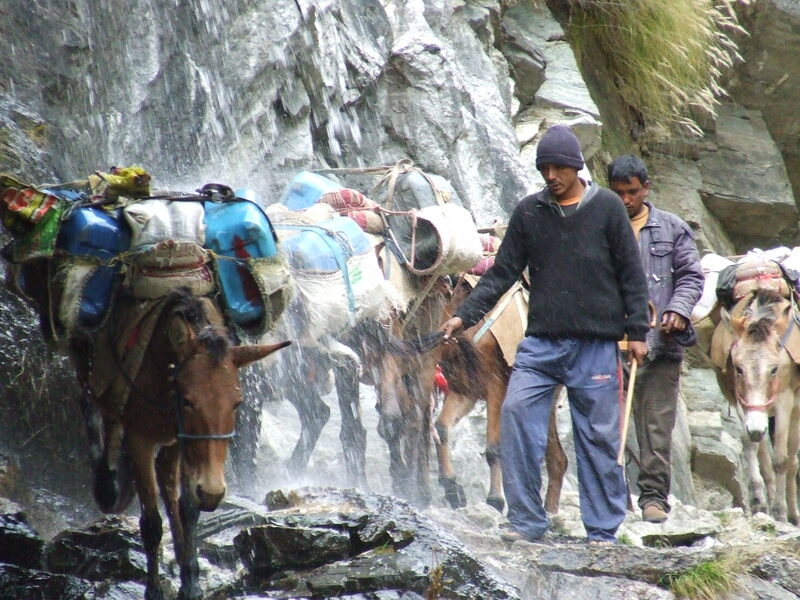 All show a narrow path, impassable with mules. At some places, It is necessary to undo bags and use our hands. We will never understand where begins and ends officially the Milam path! We are overtaken by a group of men. They seem to wait for us on an overhang. 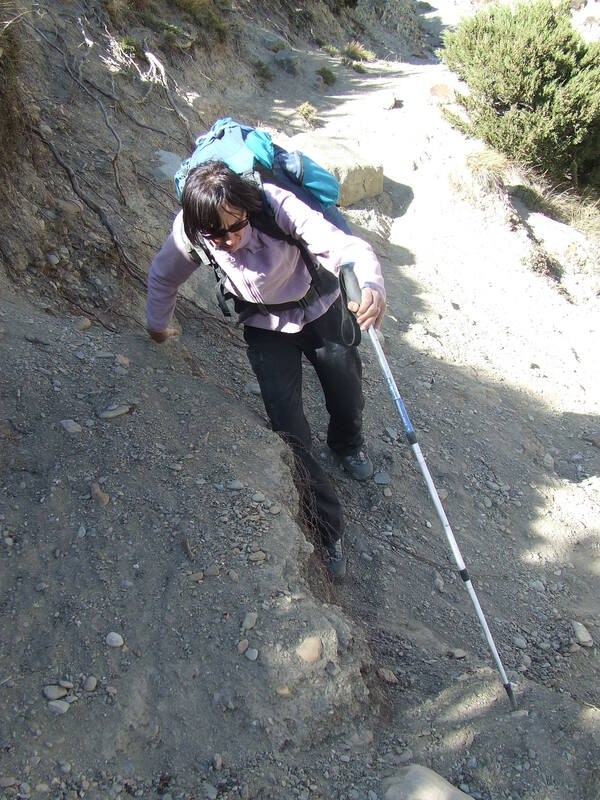 We imagine that we will need the complete day to reach Munsyari because we do not see the end of this steep path and we are not heading to Darkot, according to the GPS. The group does not wait for us. They wait for a vehicle! We come on a rough track. We believe that we may have arrived at a place where jeeps can pass. An old lady with her daughter also seems to wait. We sit shortly before seeing a jeep loaded with many packages and an iron sedan chair on the roof rack. The men take the parcels from the jeep. Among them, I see bottles of whiskey. The evenings are long in winter. We imagine that the sedan chair will serve to take down to the valley the old woman. This possibility suit us well because everyone could not enter in the jeep! But men seem to reject the option of sedan chair and begin to link pieces of bamboo. Grandmother will go down on a bamboo chair! 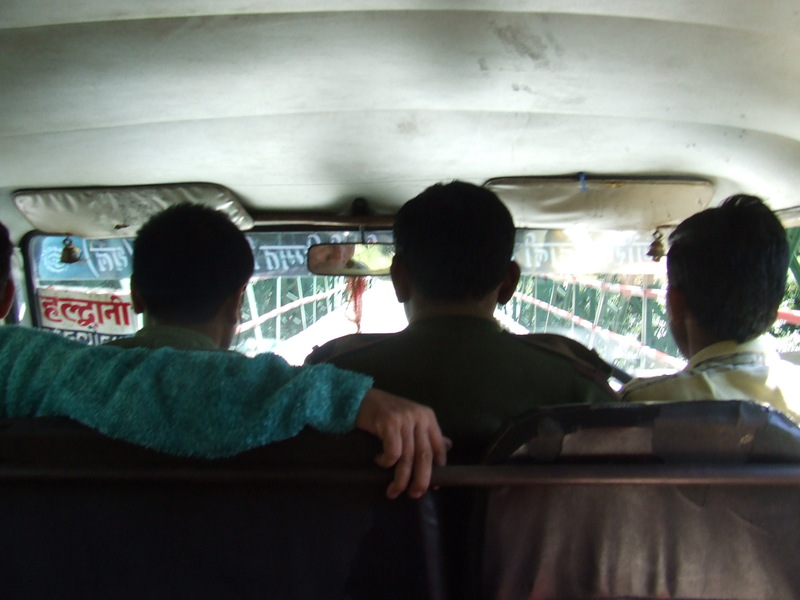 The driver tells that he will take us to Munsyari. We load the bags on the roof after the sedan chair was relocated there. 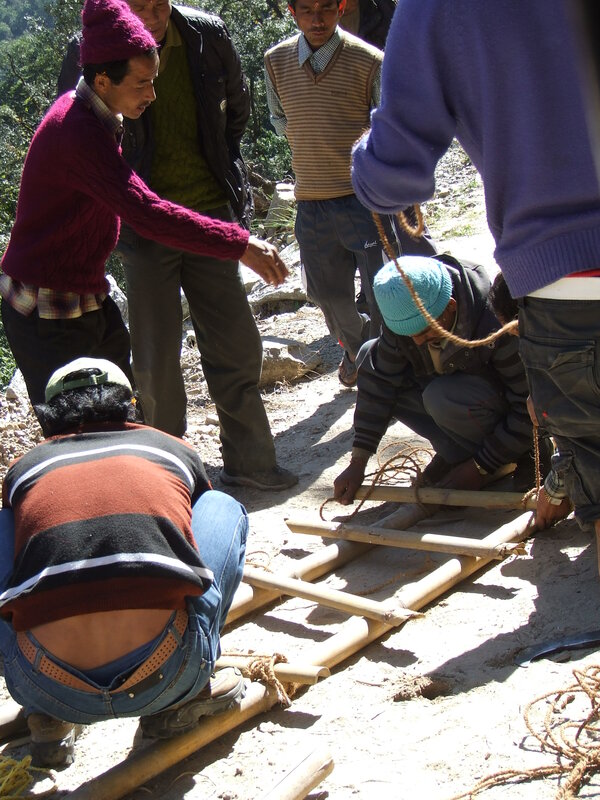 The group takes from the jeep a last heavy package they install with difficulty in the bamboos. They say it is a « mantar ». We understand that this is a votive stone they want to take down into the valley. The grandmother will have both feet to follow! Unfortunately, we do not have time to see our crew moving off as our driver has other races in perspective. Here ends our trek to the valley of Milam. Munsyari seems very noisy after the quietness of the mountain. 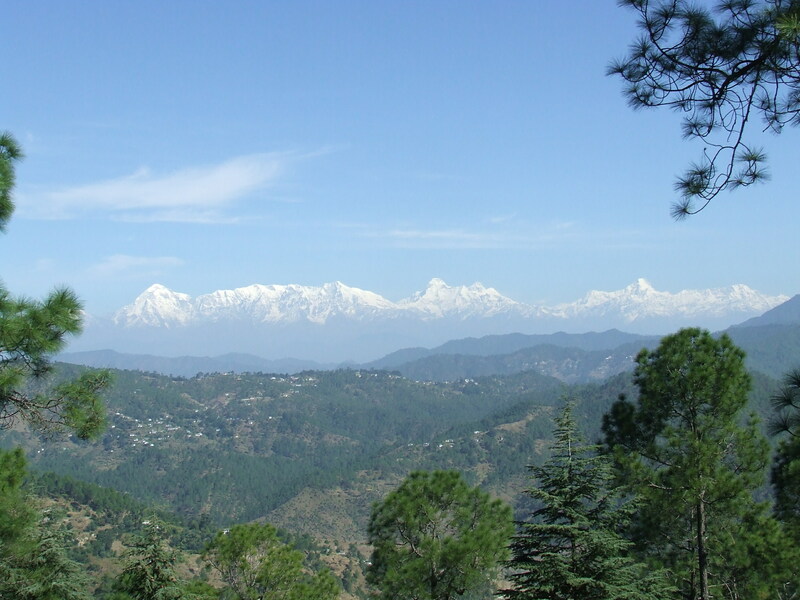 After lunch at our Pandey Lodge hotel, we look for solutions to reach Almora, a small famous resort town in the foothills of the Himalayas between Munsyari and Haldwani. The son of the boss find a jeep for us (350Rs * 2) in the evening. The hotel is not heated and we take our dinner in the cold, condemning the gate so that it does not open with the air currents caused by the icy wind. The Chicken curry warms us a little bit. The alarm rings at 5: 30. Our bags are ready. We take our breakfast at 5: 50, only with toast and tchai because of the early hour. The taxi takes us to 6:20. We travel with a young Indian couple on holiday. They are editors in Mumbai and have abandoned their work to visit India as they have enough resources. This is the emerging indian middle class! There are not enough travelers to pick up on the road and the driver must stop halfway for us to take another taxi. It becomes a habit! We have time and we enjoy fully the bucolic scenery during the pause imposed by the waiting. 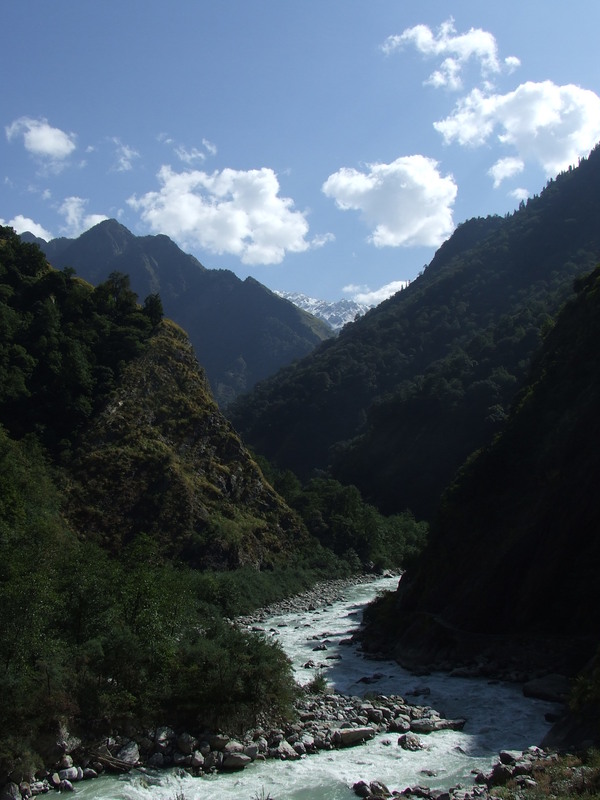 Everything is quiet and charming after the immense mineral of Nanda Devi range. 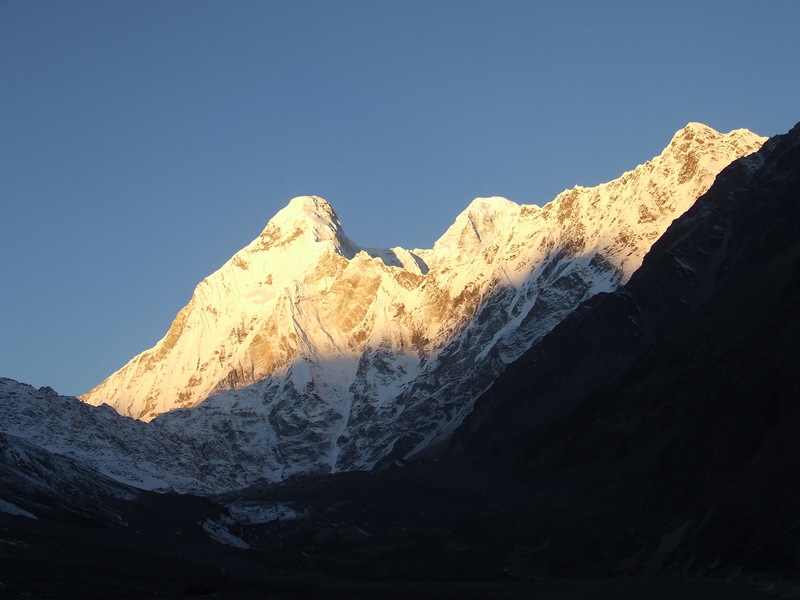 Nanda Devi always follows us in our descent. We arrived around 15h in Almora. The jeep drop us because it continues further, probably to Haldwani. We pay 700Rs agreed with the first driver. We go to the uptown as we were advised to find a hotel. We find a very nice one in the Lala Bazar (Ban Sal Hotel 500Rs 29 ° 35’56 .36 « N – 79 ° 39’34 .80 » E). 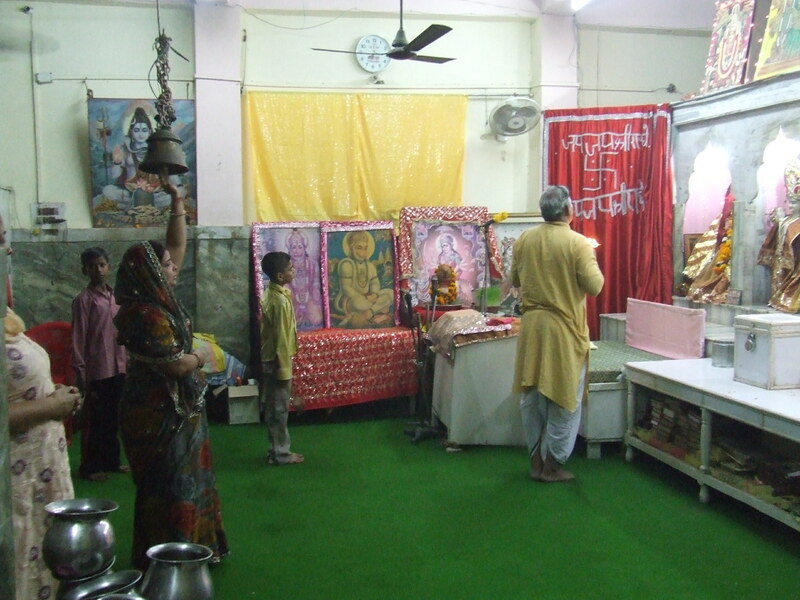 In this district, the worlds of Islam and Hinduism are forced to live side by side. The marriage is not a love one apparently: when I salute an imam in his mosque by joining my hands on the chest as it is customary in India, he greets me with a very dry tone. We quickly make our last laundry. 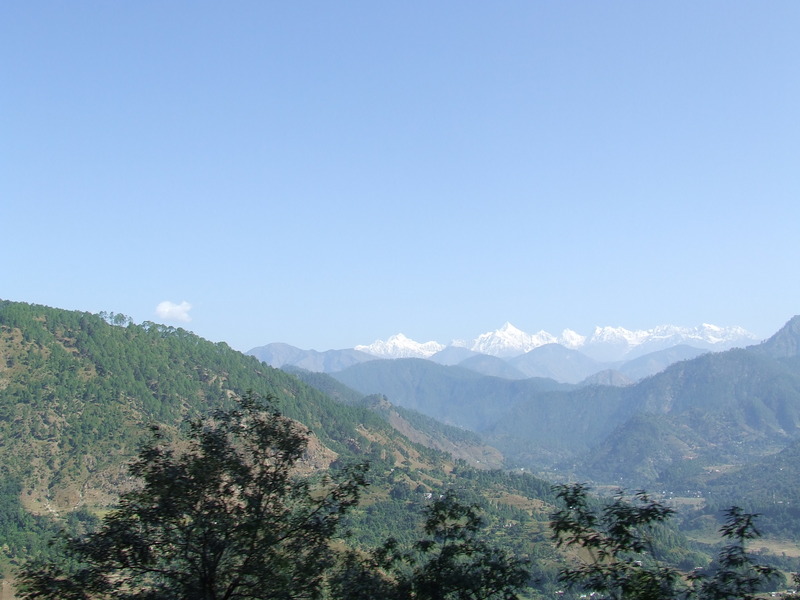 We head with GPS in the direction of the Nanda Devi hidden by the hill overlooking the city. We would like to say goodbye before joining the dreary plain. 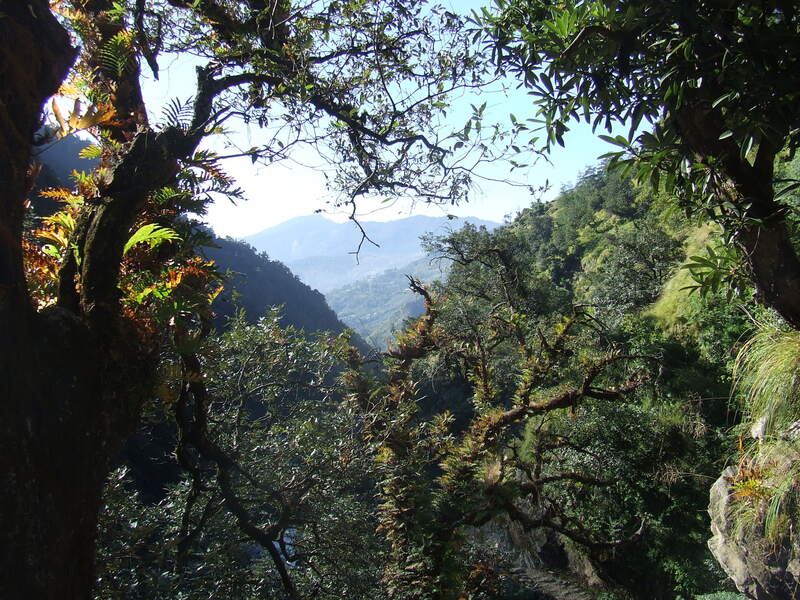 We take streets and tracks that lead us directly into a park where Nanda Devi discovers his massives floating in the sky through the pine forest. We must cross a fence with barbed wire surrounding a military place to raise enough. (29 ° 37’13 .85 « N – 79 ° 40’39 .80 » E). On this promontory, the view is superb. It is a tribute as it has to be to this mountain that made us suffer a few and dream so much. After a lunch of momos, we go to the bus stand, fortunately close to the hotel. A bus leaves Delhi every morning at 7:00. We are happy to make the journey in one shot. 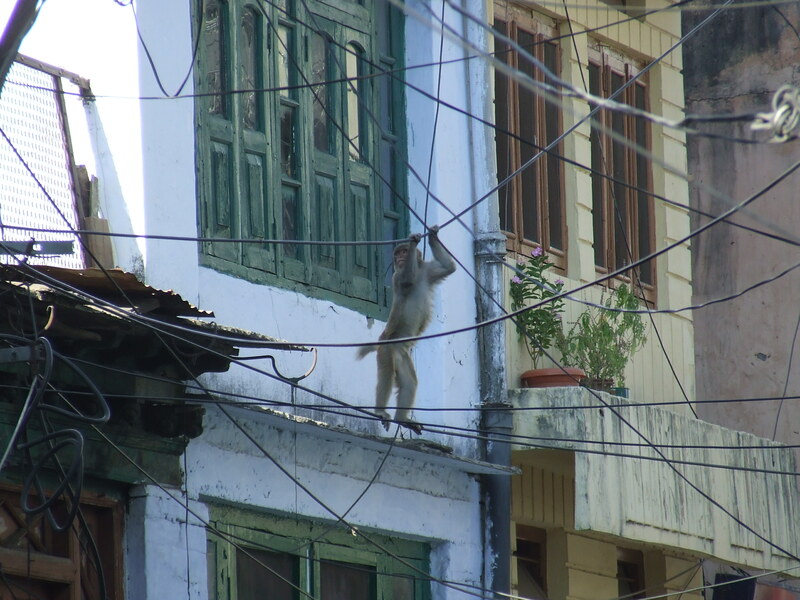 We visit this lovely and colorful town where the monkeys took their neighborhoods. We buy two indian outfits for Sylvie, a tablet for chapattis (90Rs) for exotic meals in Thimécourt and a cheap pair of sneakers (200Rs) for me but as we discover in France, both feet are the same! The alarm rings at 5: 30 and the owner brings us breakfast in our room at 5: 50. What kindness! When we arrive at the bus stand at 6: 20 bus has not yet arrived. Here’s one that comes at 6: 30 and as I ask the driver if it goes to Delhi, he looks at me like I was a Martian and shows me the sign on the windscreen, written in Hindi. « Obviously, it goes to Delhi! The journey (331Rs * 2) is very long, especially on the first part of the journey. The kilometers indicated by the GPS are also bird km but this time not because of the numerous deviations but because of traffic jams. The bus rubs with handcarts as well as donkeys and pedestrians. It will just take 12 hours for the 330km to the station of Ghaziabad. The train does not go much faster but it is a much better way for legs to travel when it is not crowded. The metro would allow us to go to Pahar Ganj but we prefer rickshaw (200Rs) to get some air. A reel brings us into a decent hotel (600Rs). We find the famous kingfisher and fries in Main Bazar bars. Civilization is not so bad. 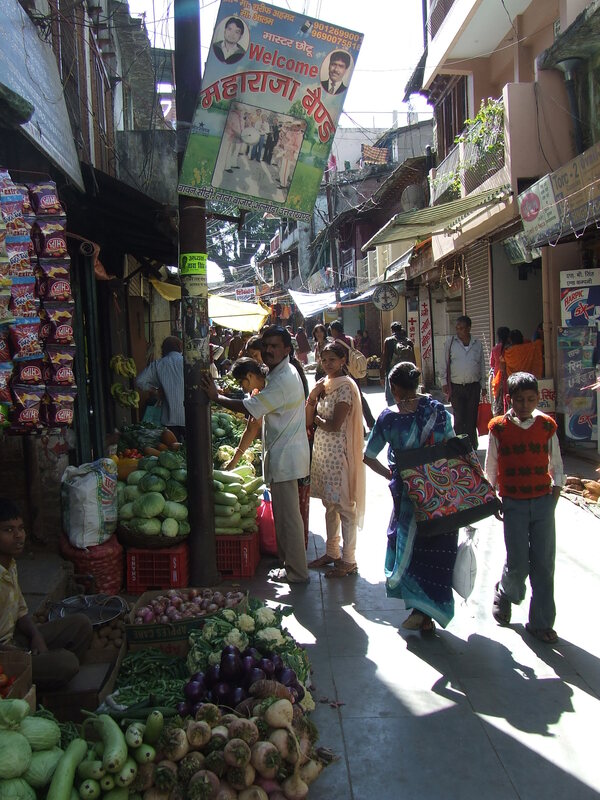 In Main Bazar, enter the first bar from NDRS to the left rather than in the second a little further on the right. The staff is nicer, better food and cheaper beer! 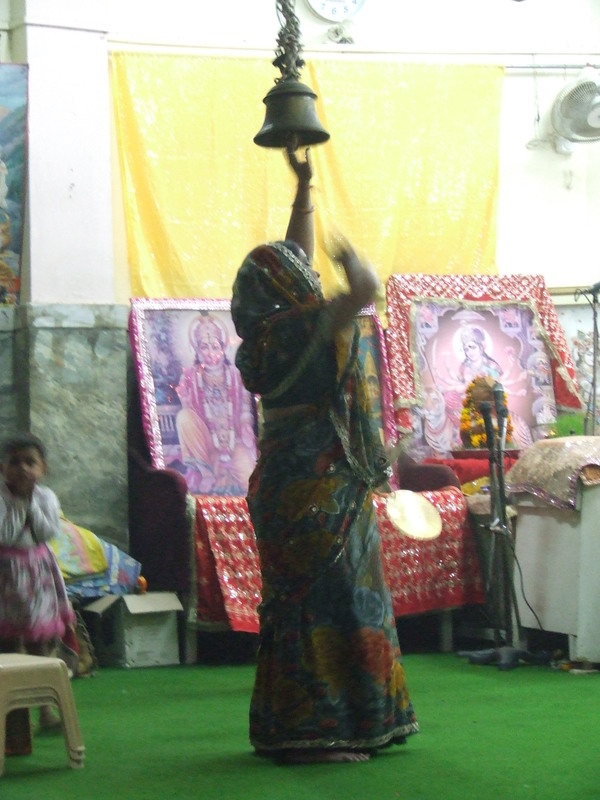 This time we are woke up at 5am by incantations and ringing of bells from a nearby Hindu temple. Religions are at joy in expressing their rites and Hinduism beats Islam by their durations! We are looking for a restaurant at 8am for breakfast. We waste our time. The neighborhood is still asleep, as if he had a hangover. We are far from mountains where life begins with and sometimes before sunrise. We head to a small eatery just steps from the hotel. The owner is very welcoming. He works with his father and his son. 4 buttered toast and tchai to 20RS for 7RS. 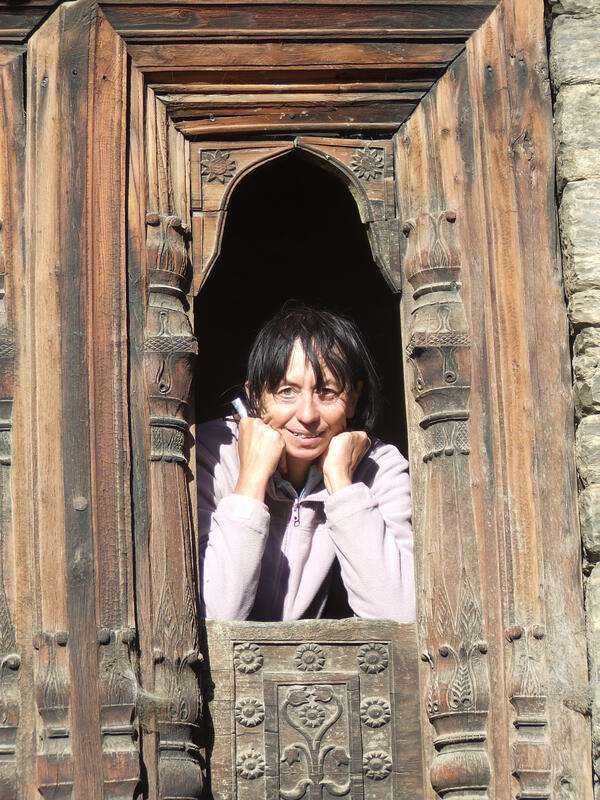 Sylvie doesn’t want to return to the Friday mosque because she received a stone the last time from a welcoming muslim. She has also to wear a hot synthetic djellabah. 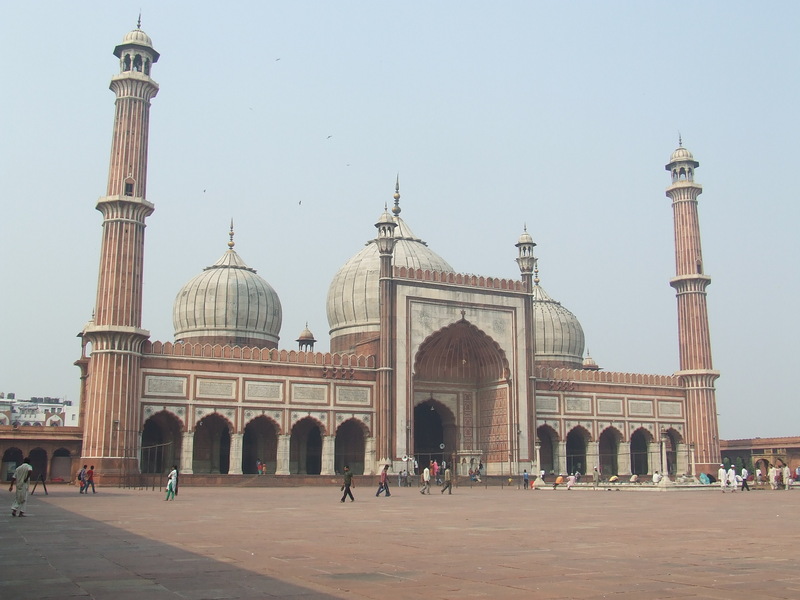 But the Friday Mosque is the most beautiful in the world with its white marbles and red sandstones. The brightness is also much better at the end of October. I propose, however, to Sylvie to organize ourselves another visit to complete our last day in India. A museum? Another monument? She cannot find anything to do and, finally, we left for the mosque. Ticket is now prohibitive (300Rs today for 100RS last year, free in 2000). But when you love it doesn’t count! Finally, as she is dressed with Indian clothes, the guards let her enter with no disguise! We take a great butter chicken for dinner (first bar) watered with abundant beer.